Our last day at Bootcamp, and it is our biggest day. We do some final preparations, hear a couple of more presentations from experts, and–the big item on the agenda–give our presentations. We started immediately upon arrival by working with our groups. 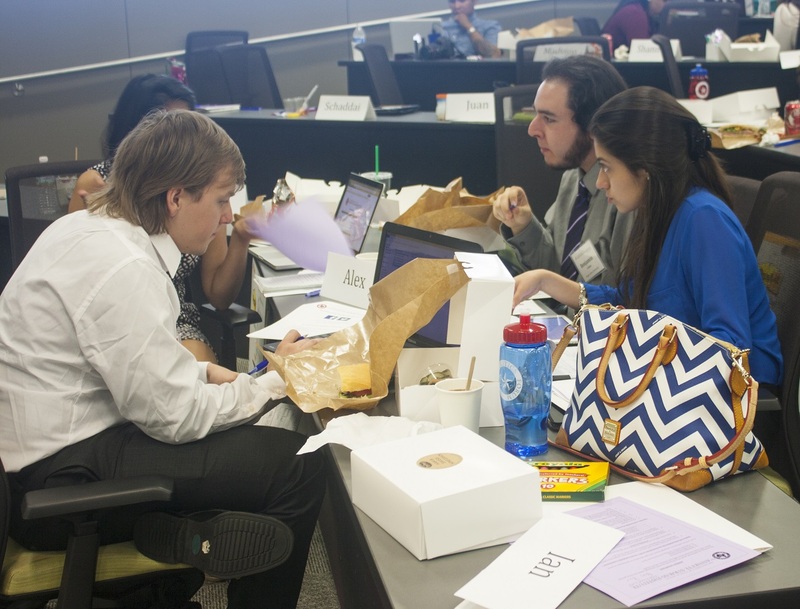 Teams were fighting leftover fatigue from the late session the day before. 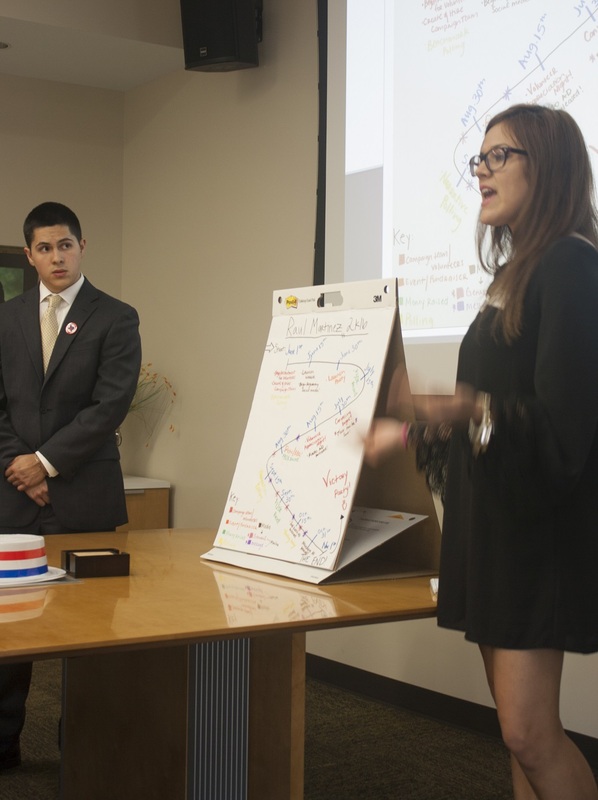 Groups were on the edge, because the deadline to turn in presentations seemed to draw nearer a lot sooner than the students would have liked. 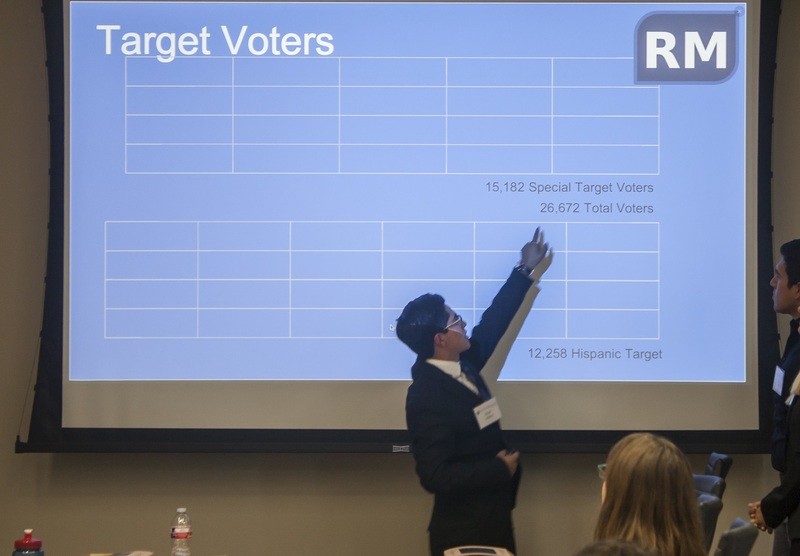 Our job was to present before the “Texas Campaign Commission,” a judging panel composed of experts from all aspects of campaigning. Knowing that you are going to put your product before the eyes of experts is a sobering prospect, but it also pushed us to go over things as many times as it took to make it right. In some cases, organizational work can be used under “experience.” That is, experience does not have to be relegated to just employment opportunities. 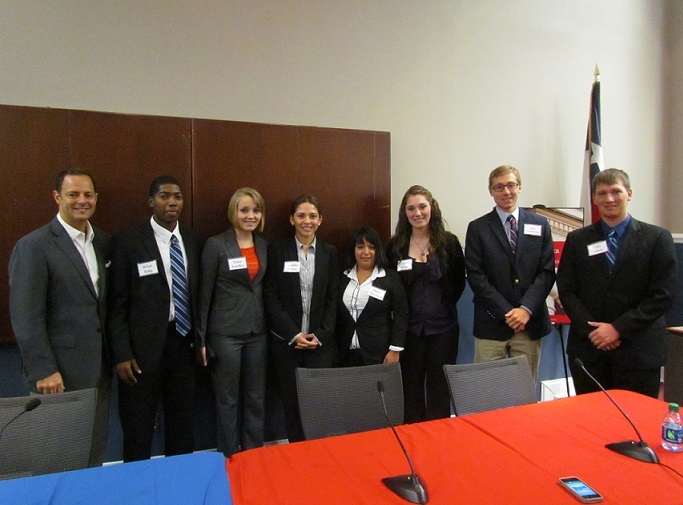 Our session on campaign law and civics was just as rewarding. Campaigning doesn’t fit into a lot of types of business practices, but there are still rules and regulations. Compliance is not only the right thing to do, but it helps prevent the loss of votes because suspicion of fraud will hamper your campaign. 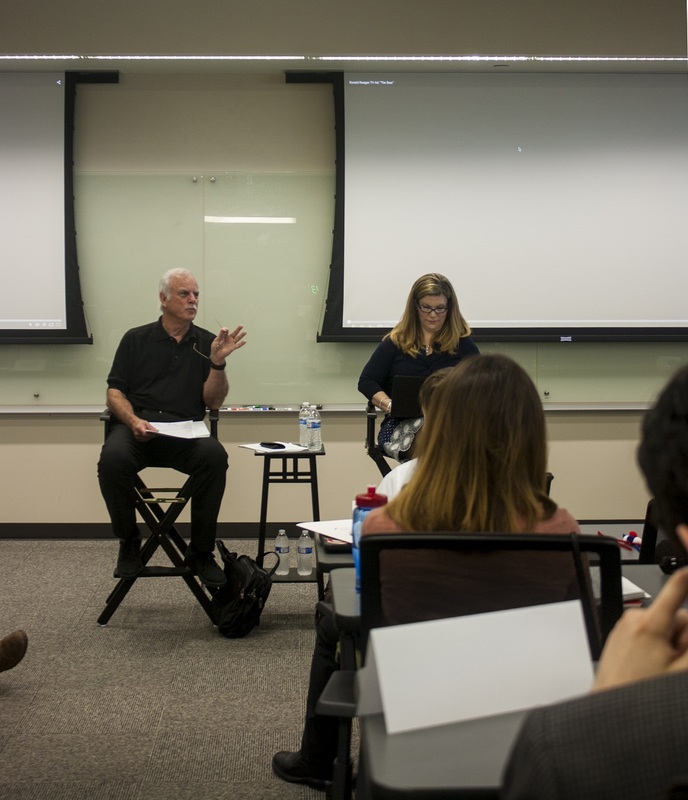 Susan Nold and Ross Peavey lectured us about certain laws and having good ethical leadership in the political world. Mr. Peavey advised candidates to know the law or hire someone who did. He gave us examples of laws that could slip through the cracks, and end up damaging your name as a candidate. While we ate our lunch Ms. Susan Nold, Director of The Annette Strauss Institute, gave us ethical scenarios that were created by the speakers. She added that these scenarios were real experiences the speakers had encountered in certain political jobs. Her biggest message was that if it feels wrong, and someone is asking you not to tell anyone, the best decision is to resign. It was interesting to hear what everyone had to say. 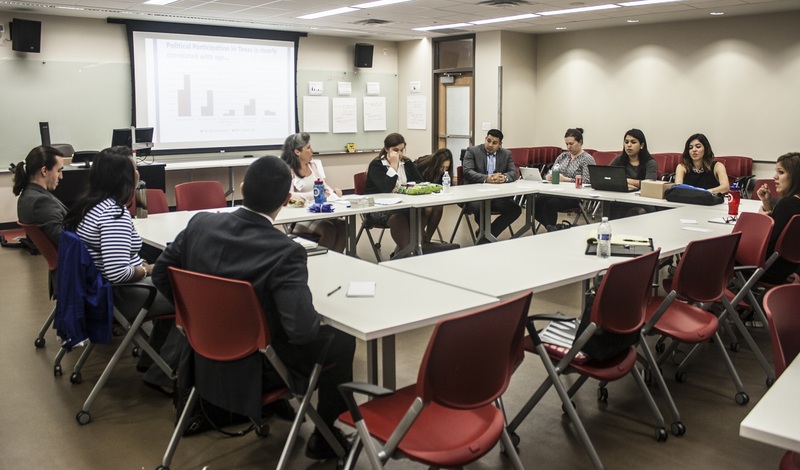 The best part was listening to people’s opinions and their ideas about how to go about solving the ethical dilemmas. As my adrenaline started flowing, Taylor Foody prompted us to begin. The time had come to actually present in front of professionals in the campaign field. The nerves kicked in, but all the preparation and hard work led us to this point! We presented information about our campaign, with each student discussing a different topic: budgeting for a campaign, recruiting and keeping volunteers, a fundraising plan, and a communication plan. 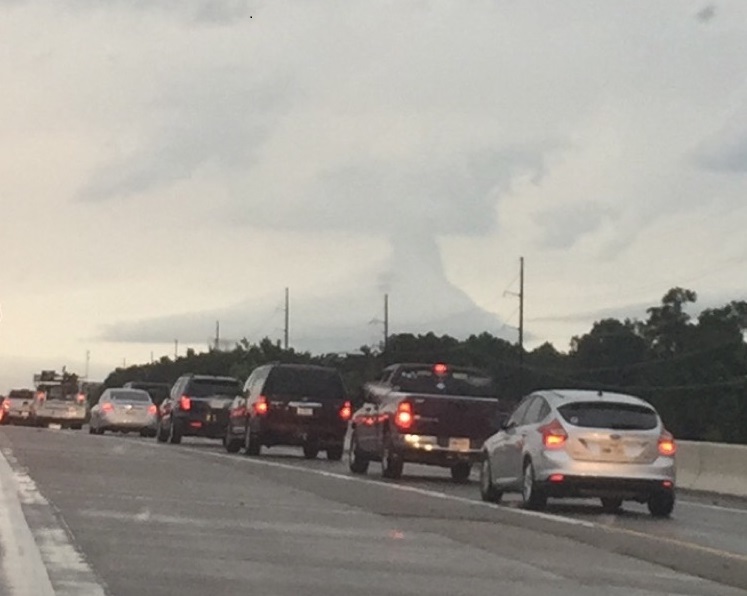 There were a couple bumps in the road. For example, we had saved all of our demographic numbers pertaining to votes on google docs, but they were apparently not saved correctly. Thus when it was Brian’s turn to speak, no numbers came up! 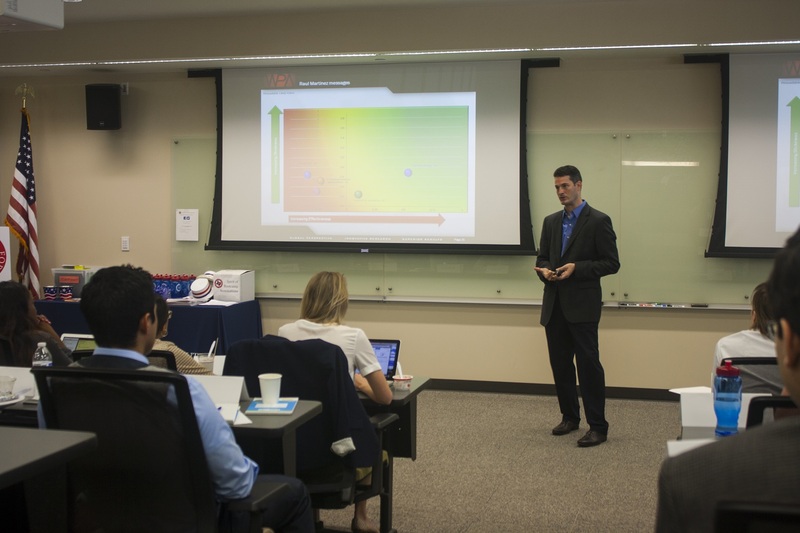 Following the presentation, the judges gave us feedback and complimented the groups on our hard work. They helped us improve our skills and keep a realistic approach on campaigning. Thank you to Matt Glazer, Luke Marchant, Cliff Walker, Taylor Holden, and Taylor Foody for helping us build our campaign skill set and encouraging us to keep advancing in our careers. Our final activity of the day was the award presentations. 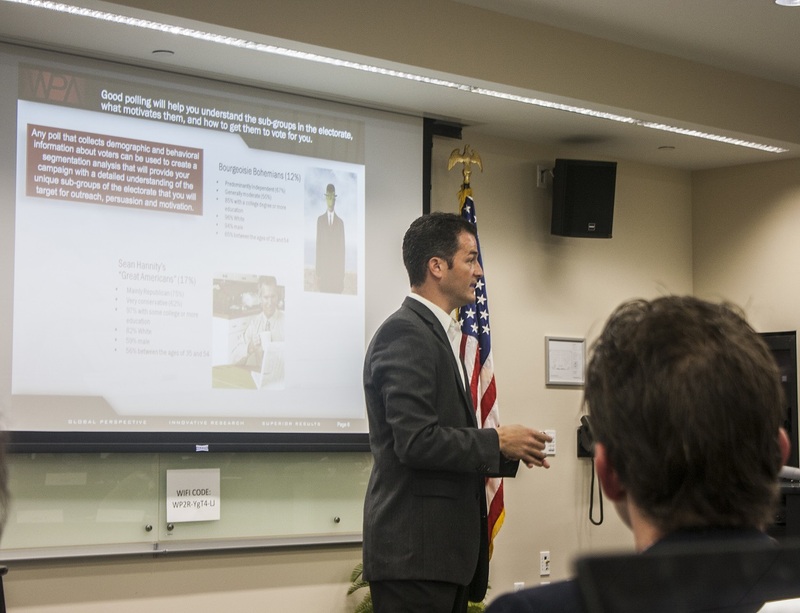 Taylor Foody, the Coordinator for the New Politics Forum Boot Camp, was the presenter. And, this being her first time to oversee the Boot Camp, she was as excited as all of us. 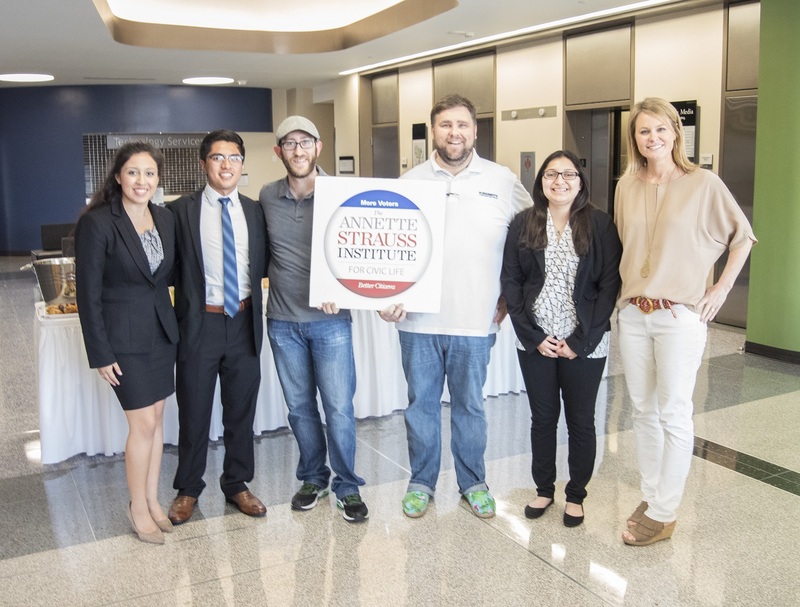 As it turned out, Isabela’s team was recognized for their “Communication Strategy,” and Brian’s team was recognized for their “Get out the Vote” strategy. With two of the three SHSU students taking home hardware (or, paper certificates), we were pretty happy. But apart from being recognized, we were more happy just to learn from the process and meet new people. After thanking Taylor Foody for her dedicated efforts , we headed over to The Clay Pit. The Indian cuisine restaurant provided a comfortable venue to relax and dine on new, eccentric dishes. These included a flavorful goat saag and lamb roganjosh complemented by comforting piquant jalapeño naan and ending with a sweet Gulab Jamun (deep fried pastries soaked in syrup) and Gajjar Halwa (a spiced carrot puree with vanilla ice cream). With a very satisfying dinner we boasted with an air of accomplishment for finishing the NPF campaign bootcamp. The 2nd day of the Bootcamp is the one that matters. It’s when the bulk of the seminars take place; it’s where we have the most time to work with our groups, and it’s a fourteen-hour day. …some revitalizing fruit, and a cup of coffee. With catchy background music (which successfully roused our spirit) we found our campaign groups so as to begin the thrilling second day of our bootcamp experience. Embodying this spirit of campaign thrill, direct mail consultant Liz Chadderdon instructed us on how to create an effective campaign message. She advised that the best rule is to follow a “one message, one piece” strategy. In other words, regardless of a candidate’s utilization of varying communication mediums such as television, radio, or direct mail, they should still have the same message across these platforms. Students were happy to speak with her after the presentation. After all, her advice helped establish some of the ideas for our projects. 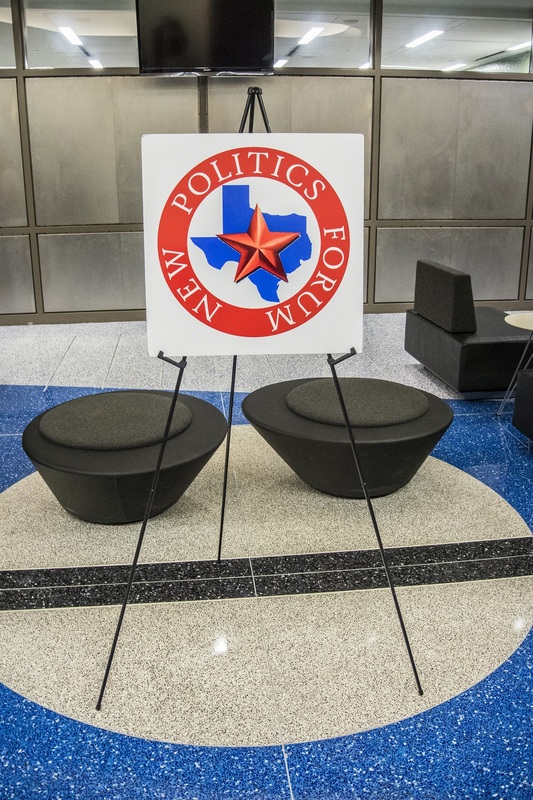 As evidence that the New Politics Forum picks out the best campaign officials to bring in, the next speaker was pollster Christopher Perkins, who has done extensive polling for Senator Ted Cruz and many other Republican heavyweights. 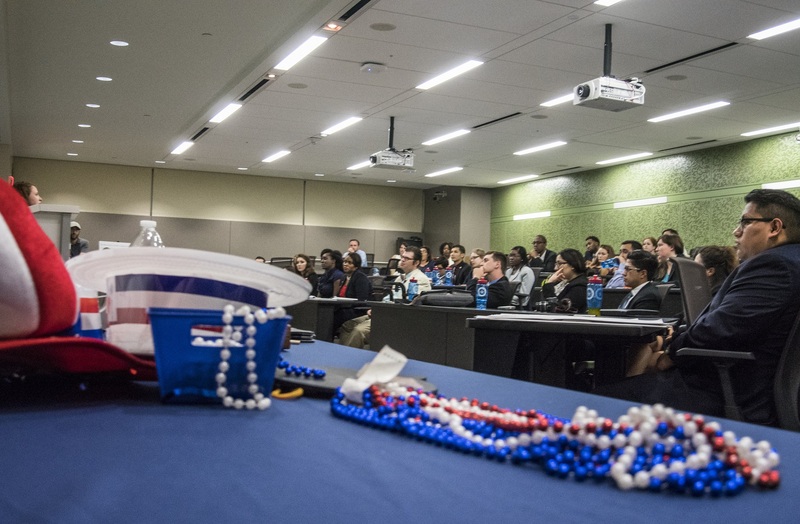 His presentation was successful in educating the students on how polling can help a candidate win an election. The students learned that polling helps makes advertisements such as television, radio, and direct mail more effective. The results of a poll can help a candidate have a better understanding of their target audience. In effect, this helps the campaign better appeal to potential voters by aligning their message strategy with issues that voters support. 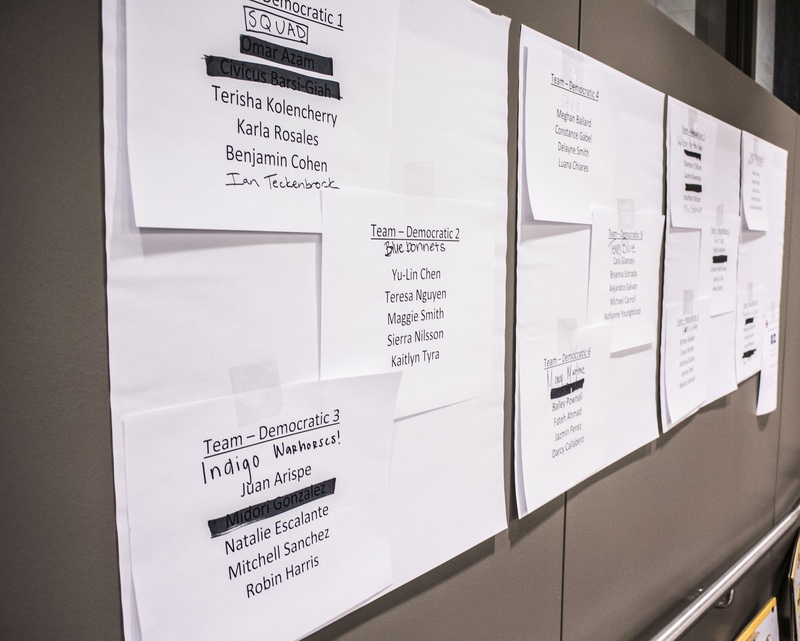 Armed with information on messaging and polling, our campaign groups retreated for lunch, strategized, and emerged in fighting shape for the afternoon sessions. 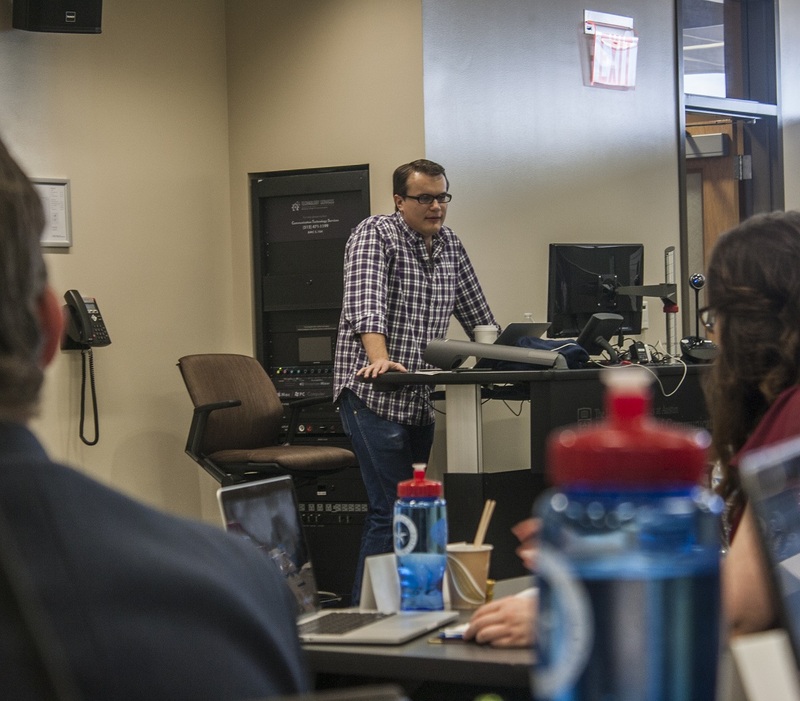 Tyler Norris, who recently worked with Senator Ted Cruz on his campaign, was the next speaker. He began by emphasizing the importance of volunteers. His advice was to gather people who believed in the candidate’s policies and give them meaningful work to do. This is not only a budget-saving maneuver, but also a good way to garner votes. After a few technical difficulties, we were able to virtually chat with Vincent Harris. He was streaming in from Canada, where he currently is working on the country’s conservative convention. Mr. Harris is the current CEO of Harris Media, and works for Senator Rand Paul. Known as the “father of Republican internet,” his expertise was a crucial factor to Senator Cruz’s web strategy during the 2012 senatorial campaign. During his presentation he encouraged us to create an account in every existing social media type. Nonetheless, he spoke about the importance of using these modern tools of communication to reach as many voters as possible. He presented them to us with humor, showing examples from previous campaigns. After an intense series of sessions, it was time for the last lecture of the bootcamp, one presented by Luke Marchant and Matt Glazer. They provided us additional information on our presentations, which will take place tomorrow. 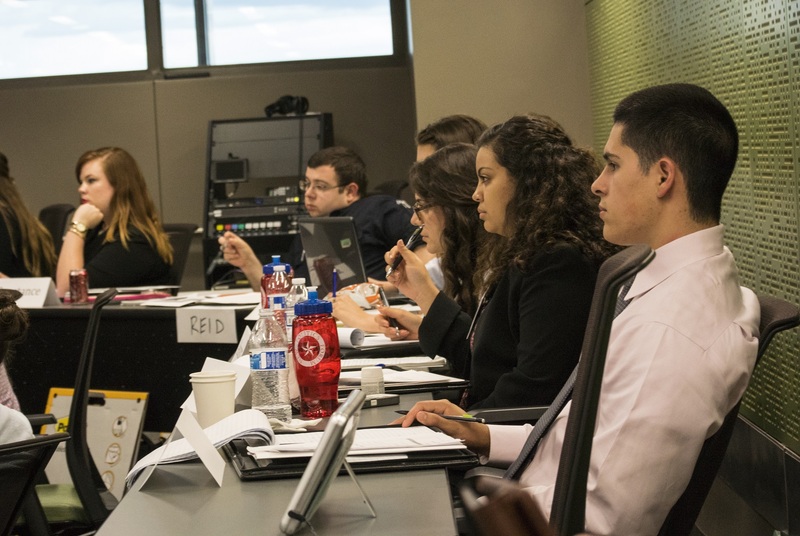 Each person is expected to participate and be knowledgeable about each aspect of the campaign, although different members may take the lead in different areas. It was great to have an experienced team of NPF staff and our mentors Luke and Matt on hand to help us succeed. But at this point, it was up to us to break into groups and work on our projects. Once we gathered in our groups we began to employ every feature of our lessons. First, we outlined our campaign necessities, then we delegated our individual duties, and started crunching data, crafting messages, and laying out the framework for the victorious campaign of House District 117’s future Representative Raul Martinez. 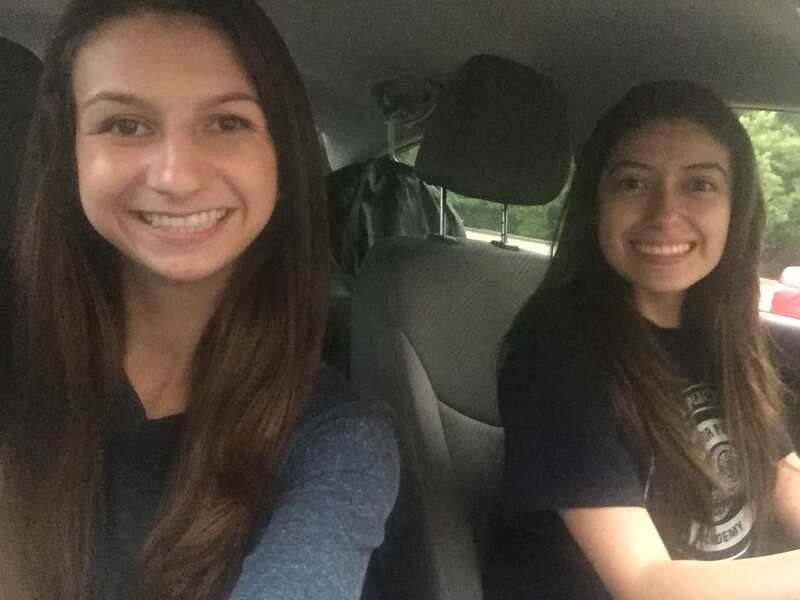 Even though our assignments were hypothetical, the toil and exhaustion was real! 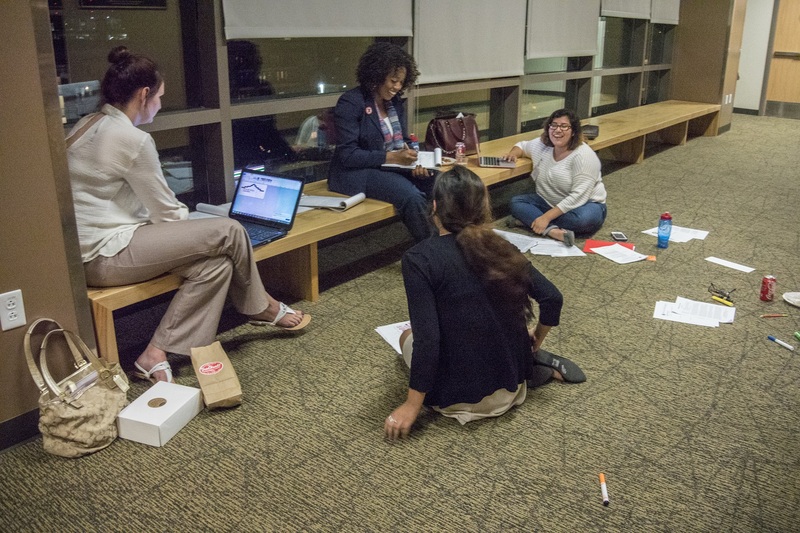 After five hours of non-stop work with my motivated team members (Juan Belman of UT Austin; Mason Rasco of TAMU; and Shauntey Walker of UT Austin), we were all ready to go home, meditate on our winning strategy, and recharge for our big campaign “pitch” day. I was set on one thing: victory! The competition was on and each group would show no mercy to the other, since we were all competing for bragging rights. 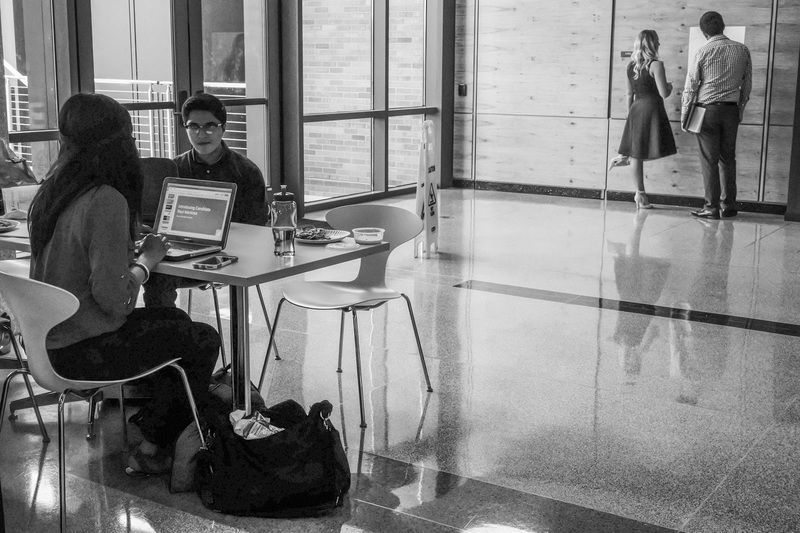 Throughout the process many students battled with a variety of emotions–excitement, fatigue, and nervousness–because they were on a deadline and had to finish. The winner would be determined tomorrow after all the presentations were completed. Who will will win? Stay tuned for tomorrow’s blog! I was eager to work with my group, and after the first break out session I became excited about the project. I enjoyed my team, and the ideas we all brought to the table. 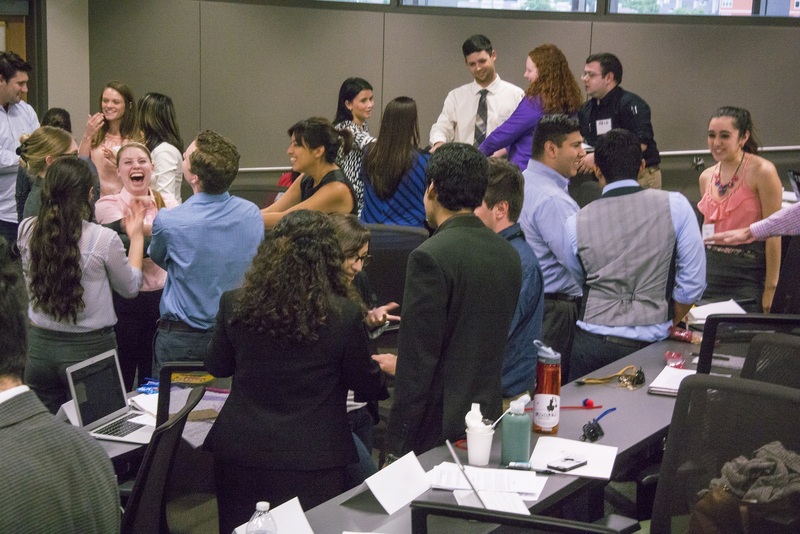 My favorite part of the breakout session was that we finally were able to get to know one another. 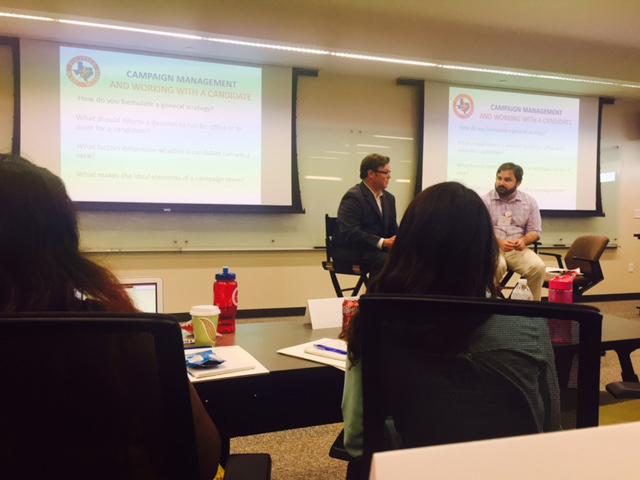 I enjoyed hearing about campaigns they had been on , and the experience they had. Overall, it was a great learning experience and in my opinion was the best part of NPF. …we also all showed a willingness to cooperate with each other. 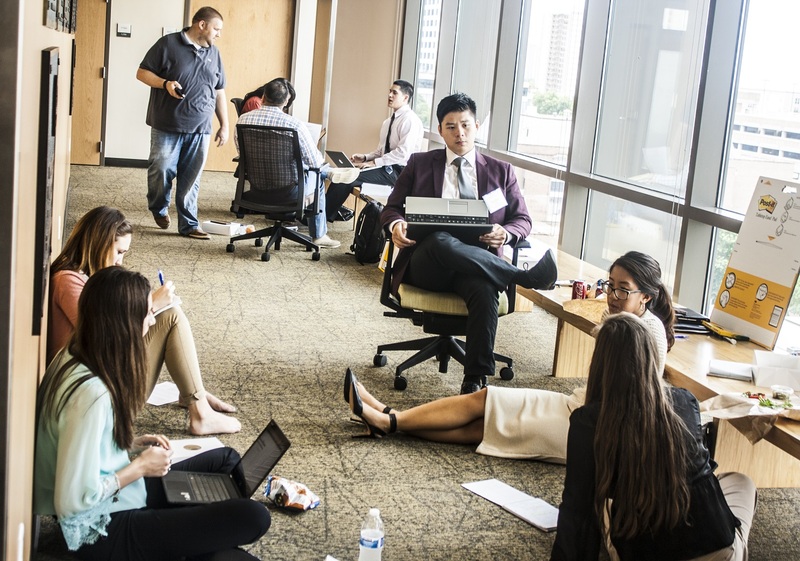 During our bootcamp experience there was never any contention related to political rivalry, and whether working in groups or alone, we were able to achieve some intense concentration and get the work done. 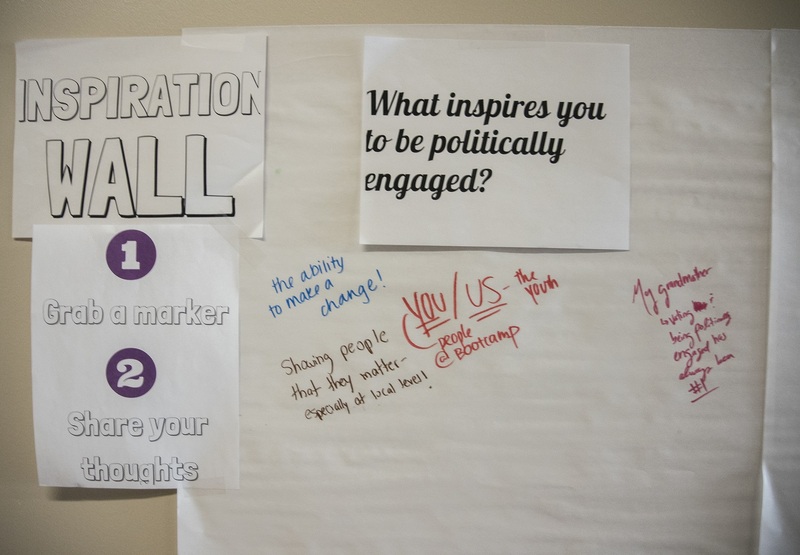 The NPF also had an “inspiration wall,” where students could write what inspired them and how they would become more engaged with the political process. With the knowledge we have gained through this rigorous, rewarding weekend we will surely perform well for tomorrow’s big day! LEAP students woke up to nerves this morning, looking ahead to a day of preparation and presentations. After roughly forty-eight hours of learning the ins and outs of campaign management, fundraising, budgeting, and direct voter contact, we finally had the chance to present our path to victory for our fictional candidates to an esteemed panel of expert judges, most of who had been lecturing us this weekend on the same topics. 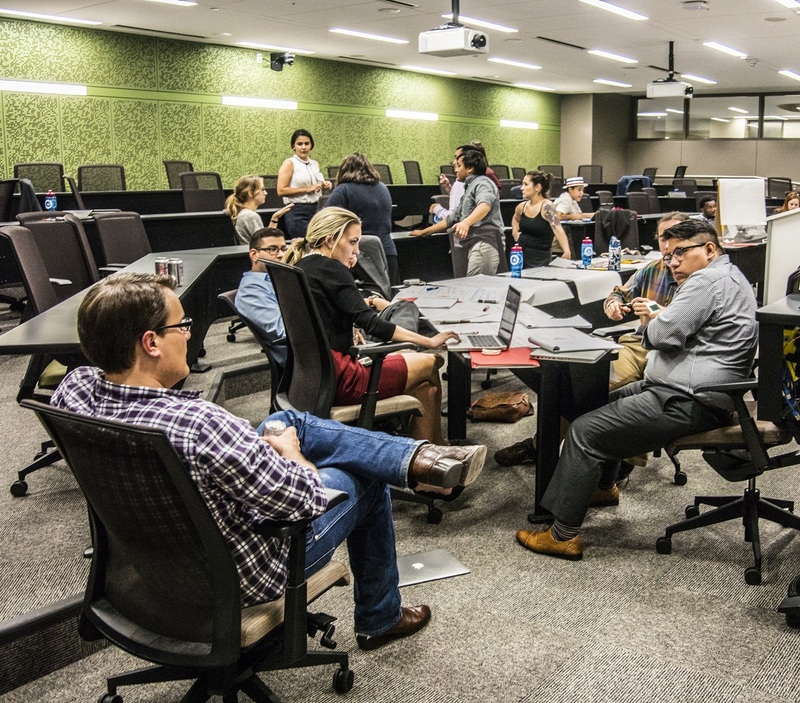 We worked for the beginning hours of the day to practice and make finishing touches to our presentations, with jitters pervading most group sessions. 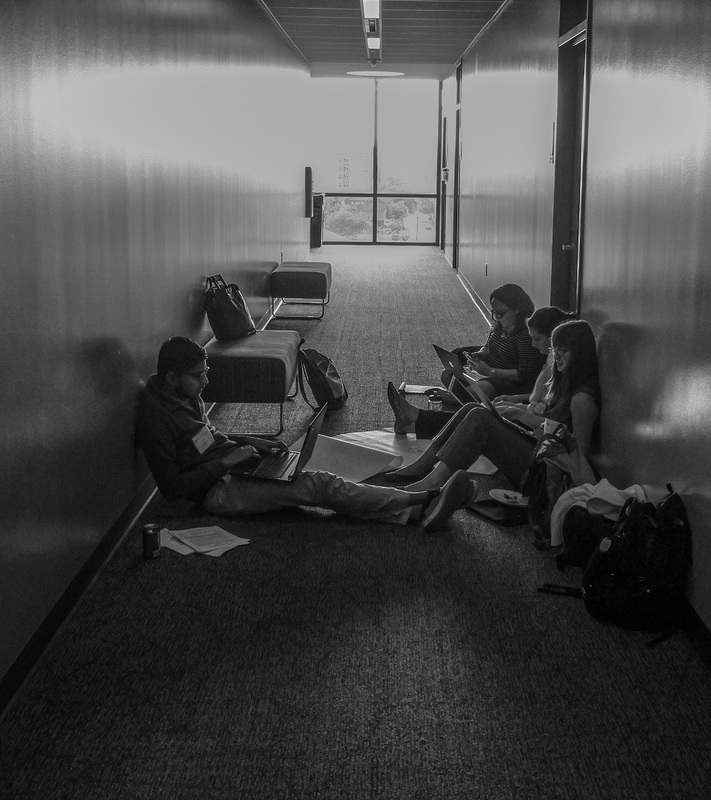 In the early morning, we made some last-minute revisions to our projects, working in groups or, occasionally, alone. By 10:30 we had to turn in our finished products and hope that everything would go well. After getting a group picture with the whole Campaign Bootcamp group, we split up into three different groups of three different rotations: presenting, a session on getting your foot in the door in the workplace, and a workshop over civic reflection and engagement in young people. After the group photos, all of the groups were separated into three rooms, one of which was meant for civic reflection. 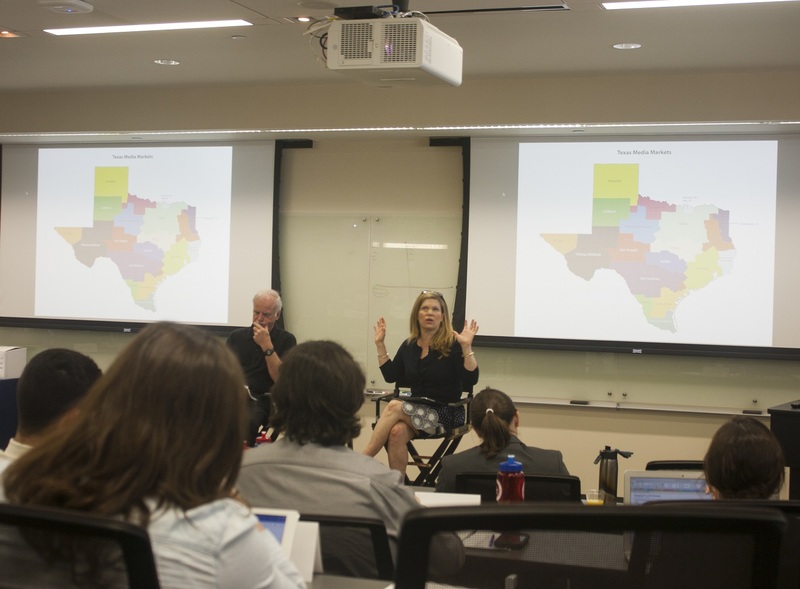 Deborah Wise, the director of educational outreach for the Annette Strauss Institute for Civic Life was there to guide the session and explained to us that civic engagement is how the community gets involved with politics. Once in the room she separated us randomly into three different groups where we discussed the lack of civic engagement as well as solutions for it. The topics revolved around the age gap in voters, why people don’t go out to vote and the impact of the media. Once we had enough time to discuss the issues and possible solutions, all of the groups sat together as a whole and we went into a deep brain storming session. Everyone had their own opinions for targeting younger people to get involved in politics but the main ones were to target education, parents, and how politics are viewed. I shared my opinion about the lack of education over local politics in high schools and giving politics a “young face”. 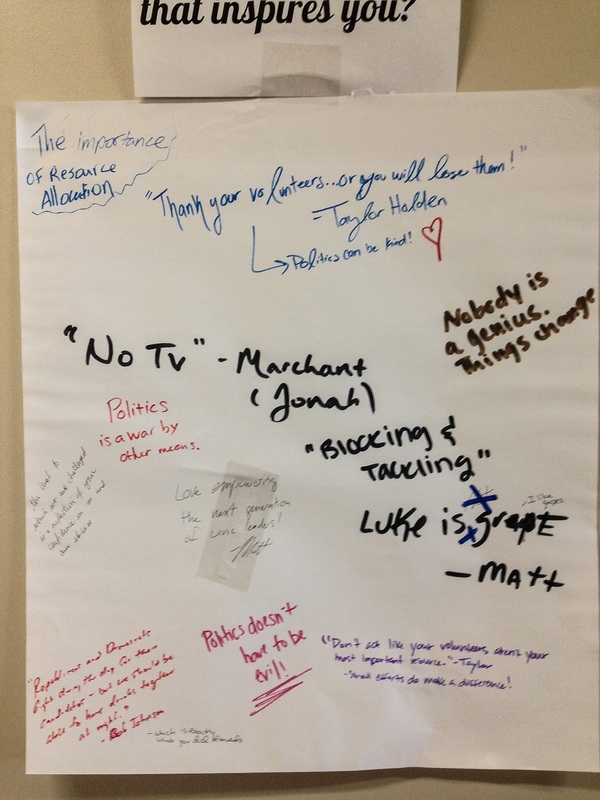 Others shared their opinions of targeting the parents and educating them in politics. Deborah Wise then separated us into groups of 2-3 to discuss plans to boost civic engagement for younger people in communities. Once we had time to discuss our plans in the small groups we went back to our whole group and discussed them with everyone. The group as a whole agreed that the reasons that young people do not participate in politics is because they believe their vote doesn’t matter, they are undereducated in regard to local government and they believe it is an old mans game and its out of their reach. Solutions for this were showing younger people that they CAN vote by setting an example and being civically engaged ourselves, local government having a bigger part in high school other than just federal government and targeting issues in politics that affect the 18-29 year olds. The Civic Reflections section was a great session that provided a more hands-on learning environment that we really enjoyed. Everyone was vocal and loved sharing and hearing different opinion. It showed us that people could really come together to solve an issue. Heading to the conference room to present between the two different sessions, each group was given just eight minutes for their presentation and an additional seven minutes to answer questions from the judges. 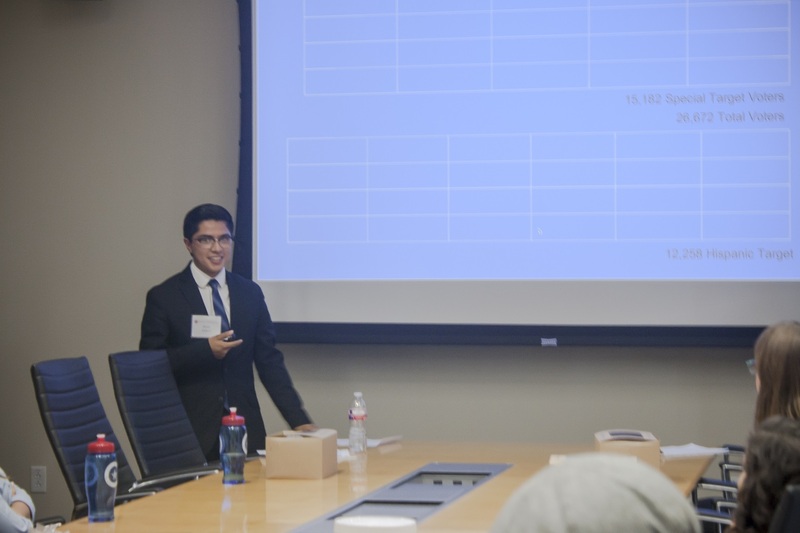 As a student, the presentation was intimidating because groups were given relatively little time to prepare and practice. Although daunting, presenting to our judges proved to be a useful learning tool and a valuable public speaking experience. In addition, each group had the opportunity to observe various other groups present and learn from what they did well and ways they could improve. Stressed the whole weekend, the hard part did not end once the presentation was over, but instead the Q & A proved to be almost more strenuous, as the judges asked questions and probed for questions that could have been left out during the presentation. The group presentations may have been stressful, however; it was arguably the best hands on learning experience and preparation for a career within political campaigns. Continuing with rotations we moved on to a presentation by Maegan Stephens, a communications lecturer at the University of Texas at Austin. We learned about the major steps for getting our feet in the door in political campaigns. We started with an interesting and fun activity of searching for the person sitting next to us on the internet and finding anything that could affect their possibility of getting hired. It was a fun way to learn about tactics professionals use to search job candidates and tips for us to remember when posting on social media. Next, we signed up for a LinkedIn account. Our trainer gave us tips for developing our account such as customizing our URL, and developing a strategic headline and summary. She also gave us great tips for building our endorsements and recommendations on our profile. After developing our LinkedIn accounts we moved on to interview tips. 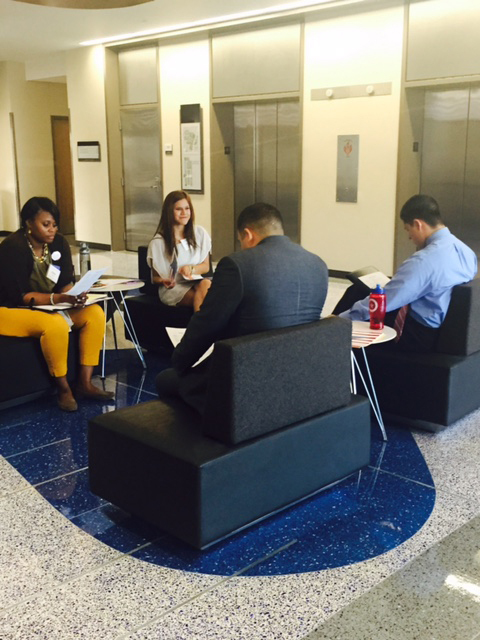 We learned that Interviews would be a very important part of an employer’s decision. We learned great ways to answer commonly asked questions in a strategic way and ideas about our goals to have clear in our mind before an interview. Clear goals will help us build a story and may brand our name. Interview delivery tips are also of great importance. We should be able to deliver effectively even if we might be nervous during an interview. Lastly, we discussed networking and the importance of making connections in political careers. 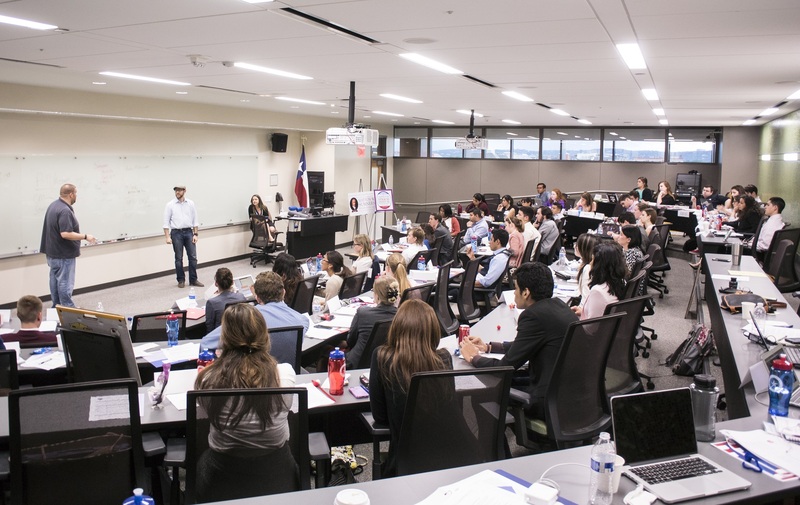 Sometimes networking may be hard, but we learned excellent tips on how to approach it and overcome challenges. 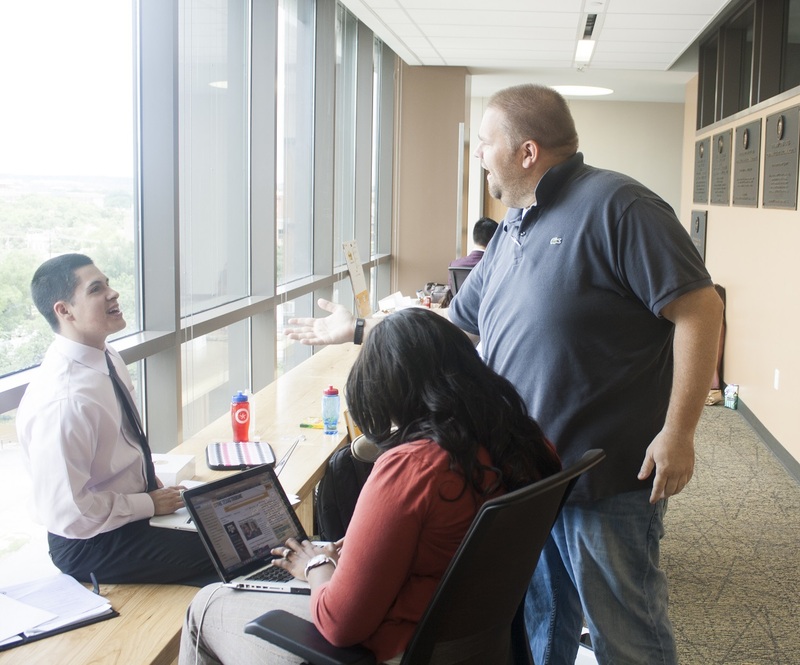 Networking should be the next step for getting our foot in the door. After our rotations and regrouping in the main conference room, we were able to give some feedback as a large group about what was good and what could improve for next year. Following the opinion piece, we finally received the judge’s decisions on the different categorical winners for the campaign plans and also the overall winner. 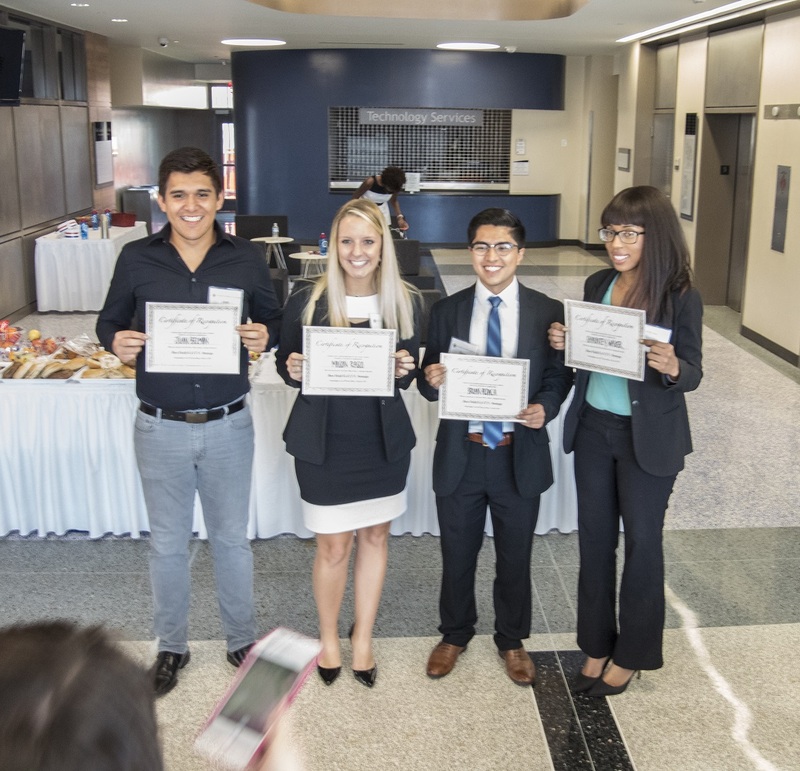 Representing Sam Houston State University, Constance Gabel and her group Democratic Team 4 won the “Get Out the Vote”/voter contact category over the other teams efforts in the same area. Needless to say after much networking techniques, knowledge, and tools for campaigning presented to us, we left the New Politics Forum Campaign Bootcamp completely different students. …and then headed back to the hotel. 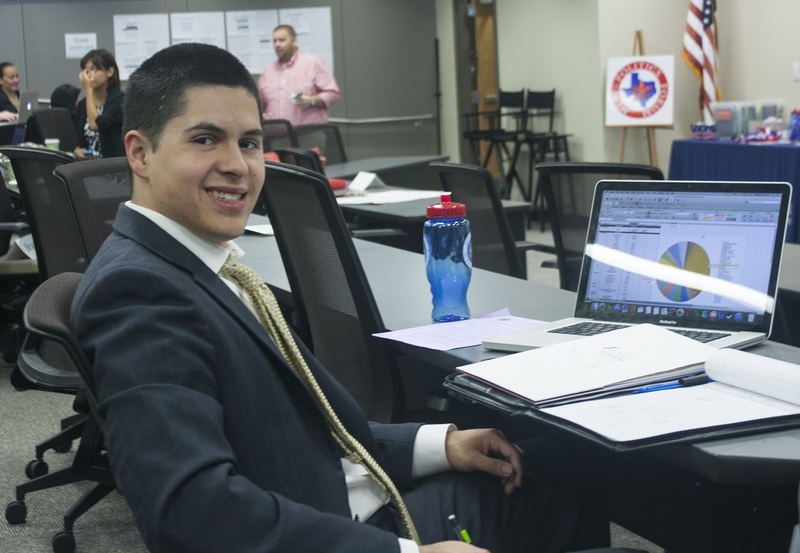 At this point, Jazmin Perez and Mitchell Sanchez had to leave, going back to Huntsville to begin work the next day. The rest of us, however, stayed on in Austin for another day to watch the House and Senate in their final day of the session. 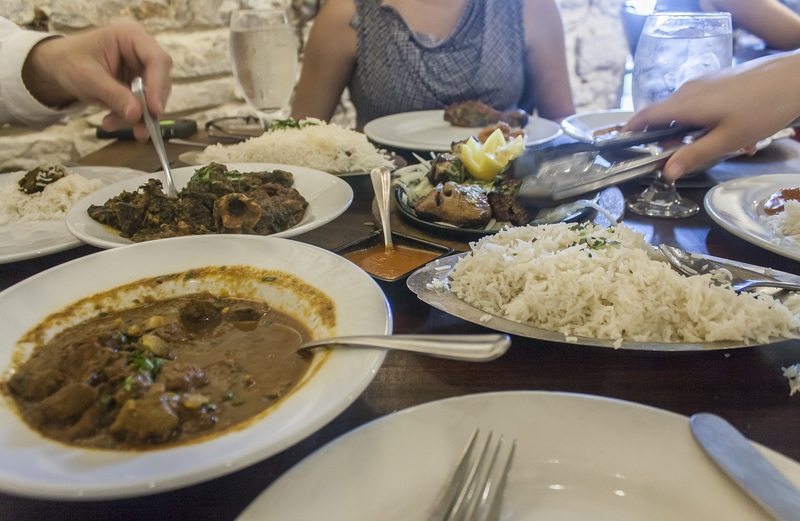 To finish the day, we ate dinner at The Clay Pit, a wonderful Indian restaurant in the heart of Austin’s downtown. Most of us not ever having tried Indian, it was such a blessing to have a waitress that clearly walked us through the menu and gave suggestions that turned out to be delicious. We tried many different kinds of dishes including Naan, a pita bread type of dish, a seafood grill, Tikki Masala, a red sauce, Khuroos-E-Tursh, a chicken dish stuffed with cheese and spinach in a sweet, almond sauce, and Lamb Roganjosh, a lamb dish in an onion sauce that might have been the table favorite. We finished with a dessert of Chai Spice Crème Bru Lee, rice pudding, and vanilla pudding with a side of grated carrot pudding. Stuffed, we left the restaurant to take a late night stroll through some of the older parts of UT’s campus. 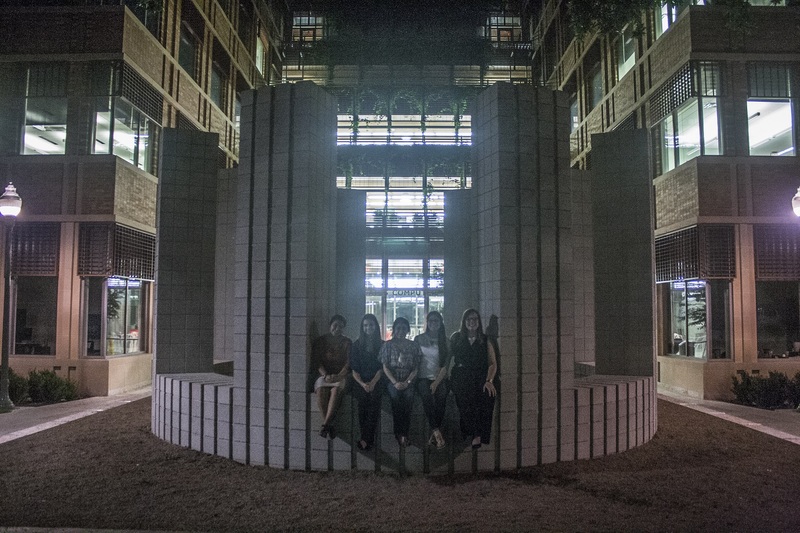 We spotted some art and some strategically placed greenery, but the evening and the whole weekend culminated standing between the UT Tower and the Capitol, feeling the immensity of the city and our civic purpose as college students in a time full of political apathy. We also ended the weekend a much closer group, better prepared to tackle future challenges and opportunities. We ended the evening exhausted and drove back to the hotel ready to tackle the last day of our weekend trip. LEAP Center Students would like to thank Emily Einsohn, Drew Galloway, Luke Marchant, and Matt Glazer for leading such a great program! 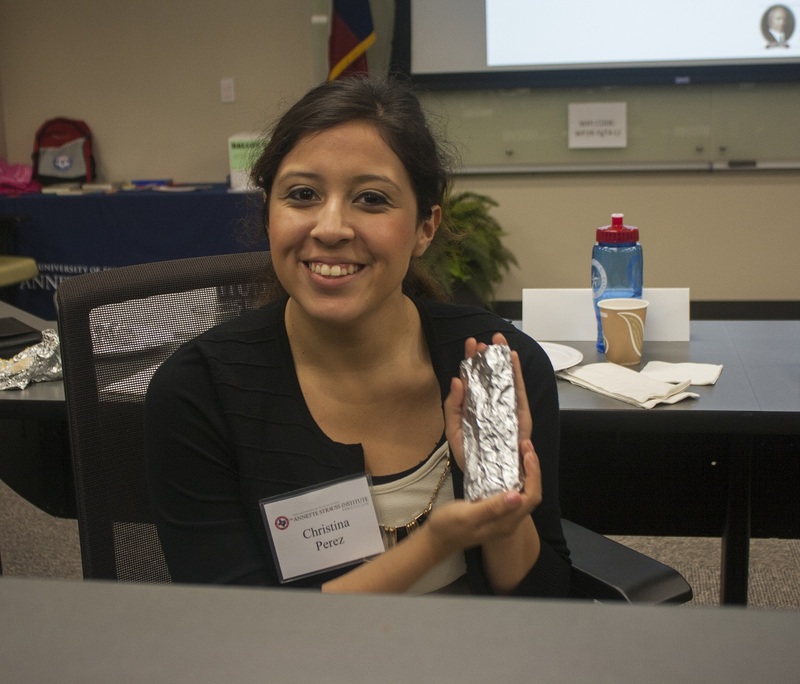 Upon arrival this morning, boot campers were greeted with warm breakfast tacos, fruit, homemade granola, yogurt, and coffee to start the second day of NPF’s Campaign Bootcamp. It was a great start to a fourteen-hour day, filled with learning about all manner of campaign topics. The first presentation of the day was centered on polling and how to use it to your advantage within a campaign. 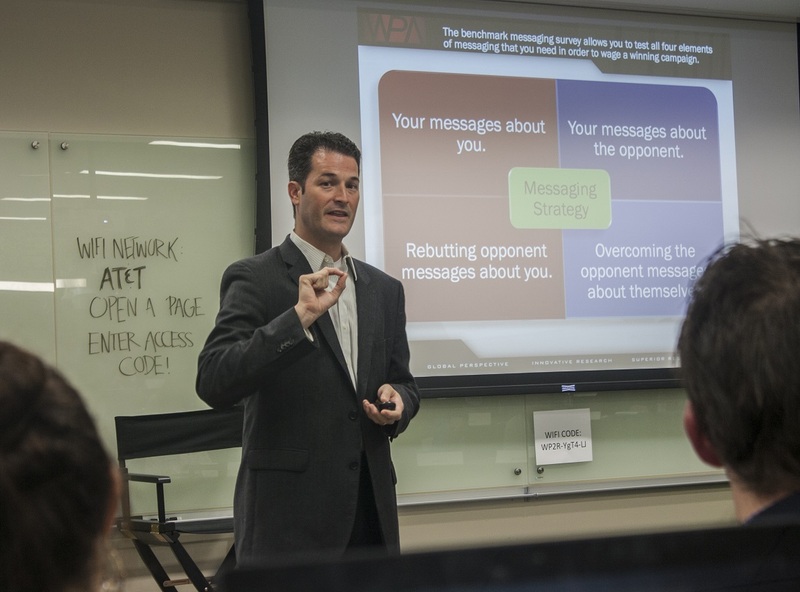 The speaker, Chris Perkins, partner at Wilson Perkins Allen Opinion Research and an expert on quantitative and qualitative analysis, presented helpful guidelines to think about when managing a real campaign. One of his main points throughout the presentation was the importance of targeting: “targeting the right persuadable voters is key to victory, especially if you cannot afford to reach out to everyone.” His close created a seamless intro for the next session, how to craft a campaign message. 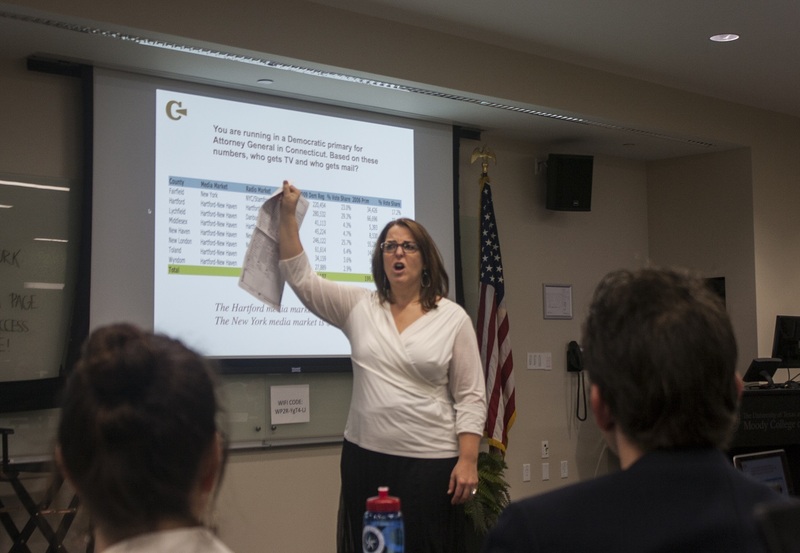 That presentation, crafting a campaign message for earned and paid media, was led by veteran media consultant Cynthia Miller, with her spouse Dean Rindy, also a media consultant. We were also reminded “it’s not what you say, but who you are.” A great way to promote a successful message is by frequency and repetition because it takes the human brain five or more repetitions before it recognizes an important message. After ten repetitions, the human brain has absorbed the message, which is especially applicable for voter contact via mail. All these great tips and strategies will be very useful when strategizing for our campaign presentations tomorrow afternoon. 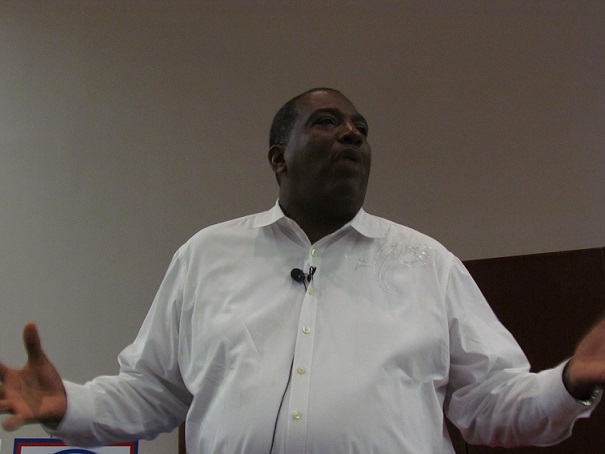 We were then introduced to “The Man Who Invented the Republican Internet,” Vincent Harris. His presentation was filled to the brim with energy and strong delivery. Harris, CEO of Harris Media, discussed the power of the digital media and the leverage this medium can bring to a party. Facebook, a large part of the digital media, plays a vital role, as do other smaller social media outlets. Currently working on Rand Paul’s bid for President, Harris believes digital media will be one of the deciding factors of the election. The direction and the ever-changing political climate have indicated that the Internet along with digital media will become king in political campaigns. The capabilities with rapid response will make it especially crucial in the end game parts of elections. 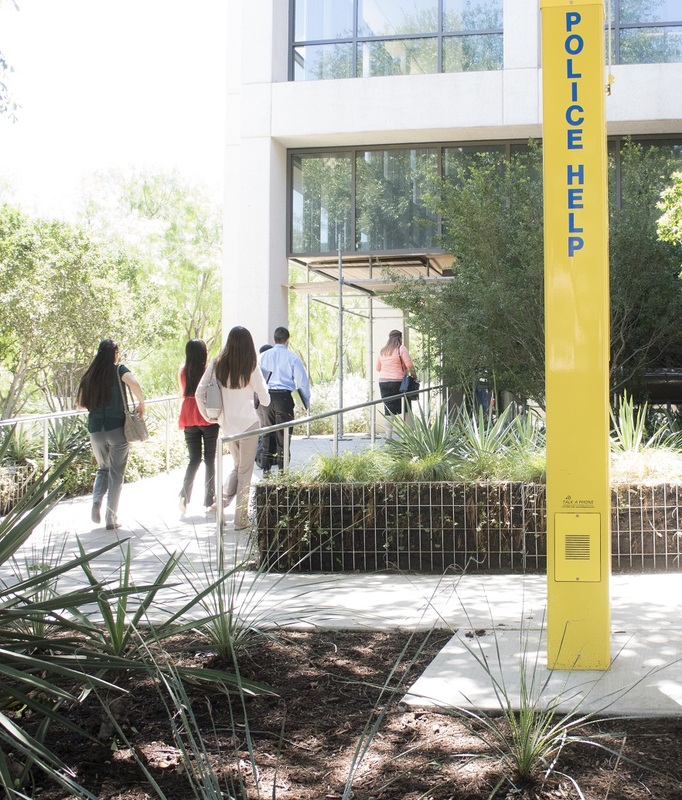 Sticking to one or two messages makes getting the word out simple and effective, and it worked for us–as we remained engaged in the midst of a long Saturday. Of course, crafting the message is part of the battle—implementing that message is another part. After the break we were introduced to Mathew Brownfield, partner at Murphy Nasica & Associates, and Colleen Loper, campaign director at Annie’s List. This session focused on teaching us the essentials of targeting, voter contact and voter files, and how to get the most from knocking on doors. Essential information resources for the campaign manager, according to Brownfield and Loper, include the district’s electoral history district census data, and on-the-ground reports. Each mentor then went into specific tools that their party utilizes to narrow their voter targets as quickly and accurately as possible. Loper spoke about the main Democratic tools, which include the Voter Association Network (VAN), DCCC, DND, TDP, Blue Labs and the Analyst’s Institute for research. 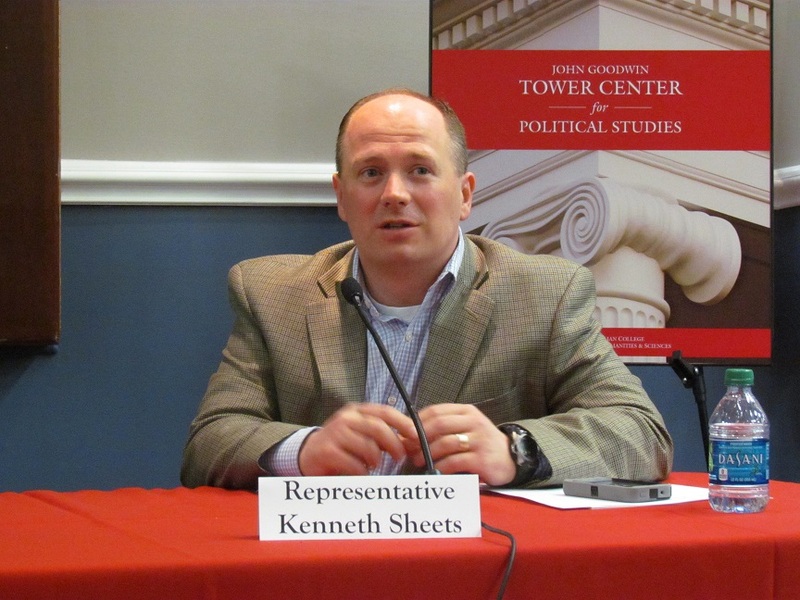 Brownfield admitted that the Republicans are lacking in this field by only having the GOP data center, but he still gave general research methods such as the state party databases, county party databases and voter files. The two presenters then explained how important door-to-door campaigning is and how it is much more effective when trying to get out the vote (GOTV), but can be much more time consuming than phone calls. We learned that “knocking on doors” drives turnout and can be an effective method when trying to target moderate voters. Knocking on doors also insulates the campaigns from any change in opinion that the targeted voter might have had. Brownfield also mentioned that block walks during door-to-door campaigning can provide intelligence on the electoral situation of the opposing campaign. 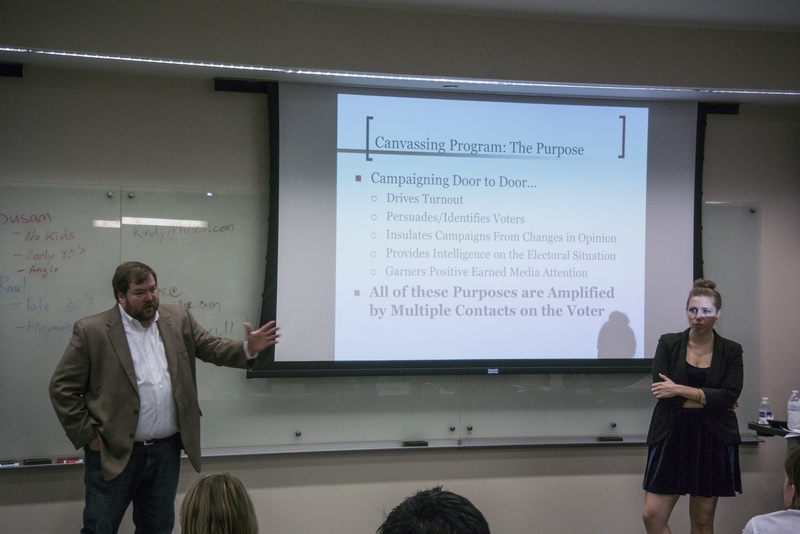 The two presenters agreed that the most appealing aspect of door-to-door campaigning is all of the positive media attention that can be earned. We learned that a good strategy when knocking on doors for a campaign is to have the candidate himself or herself knocking on doors as well. The presenters ended by mentioning that the candidate should always show that they are willing to put in work even in the smallest aspects of the campaign and that they can change a targeted voter’s mind easily, especially face-to-face. 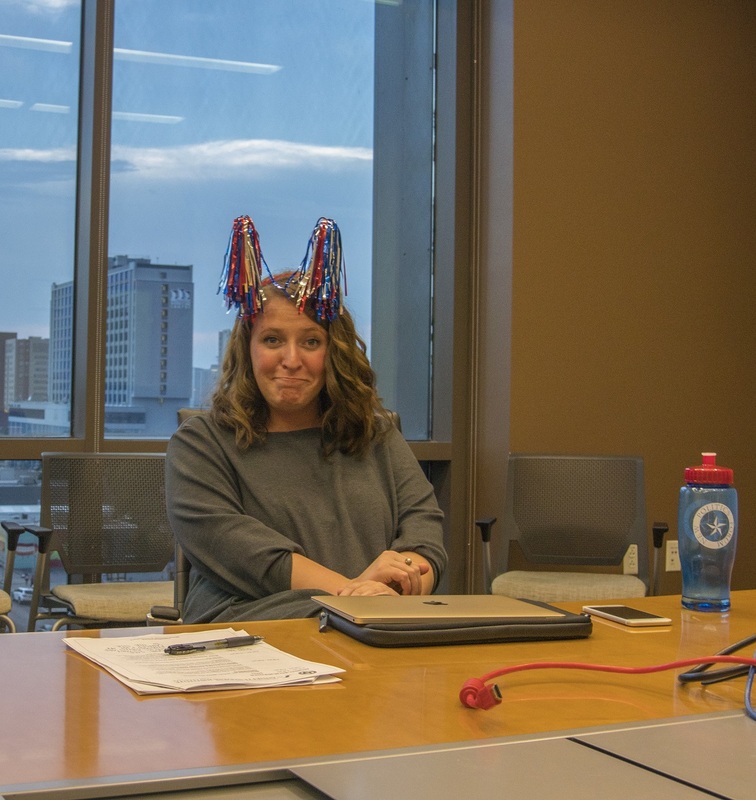 Finishing up the day of informative sessions, the energetic communication specialist, Maegan Stephens, focused on political pitches and presentations. She began by engaging the students in a quick icebreaker, allowing them to move around and tune in. Throughout this session, Ms. Stephens covered the content, delivery, slide deck, and questions and answers section of a successful presentation as well as the tools to create a political pitch. More specifically, she discussed the three parts of the content: the introduction, strategy, and the conclusion. She also emphasized the importance of delivering a presentation, being conscious of the presenter’s non-verbal and vocal communication. 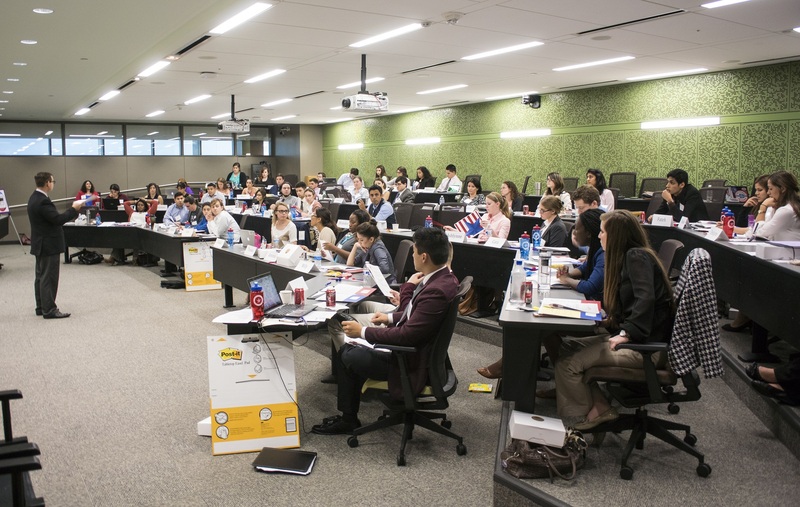 With her help we gained knowledge and confidence beneficial to our upcoming presentations. …followed by a brief overview of tomorrow’s agenda by Drew Galloway who, prior to working for the Annette Strauss Institute, worked for the White House. …from real data and hypothetical candidates from House District 117 in San Antonio. 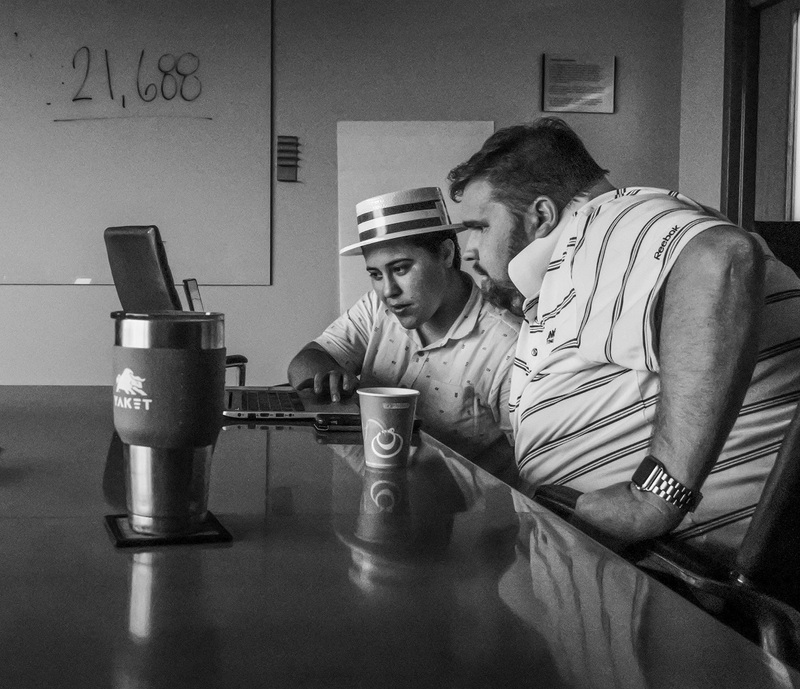 We once again practiced the “working dinner” concept and vigorously tried to get as much as possible done in our teams, with the help of our mentors, Mr. Merchant, Mr. Glazer, Ms. Holden, and Ms. Moore. 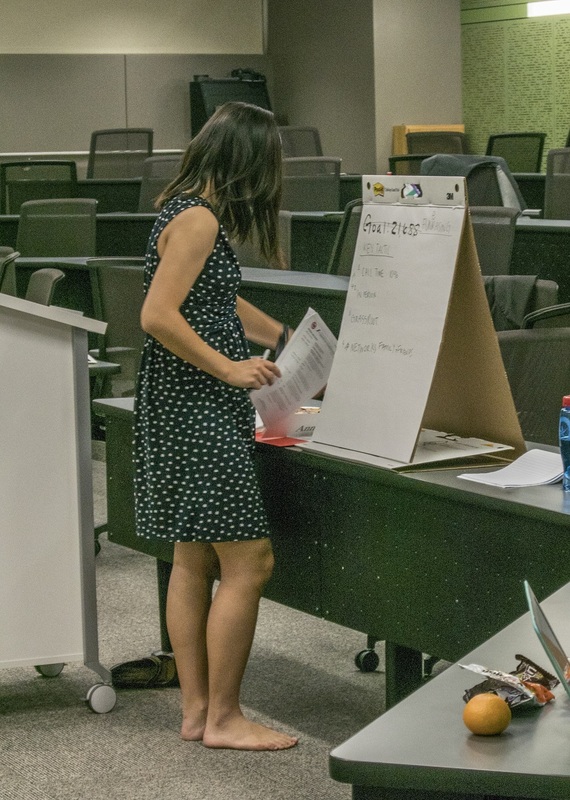 Balancing different topics such as budgeting and polling, LEAP Center students tried to recall as much as possible from the previous sessions to create campaigns that would make the mentors proud. Finally, with work still left to do, we left the campus for the hotel around 10:00pm, for an evening of blogging, research, and presentation practice. Hopefully, some sleep will follow this evening while we look forward to a packed day of presentations tomorrow. 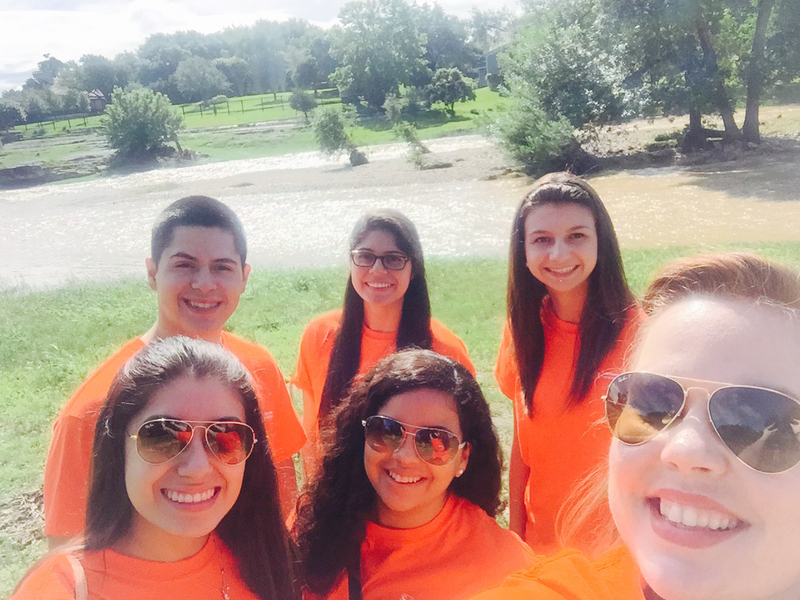 To begin of our first full day in Austin, LEAP students headed to Salado, TX to explore a tiny, tourist town full of southern hospitality. Upon our arrival, we visited Salado Creek with hopes to see Tabletop Rock, where wagons crossed the creek bed during the nineteenth century. 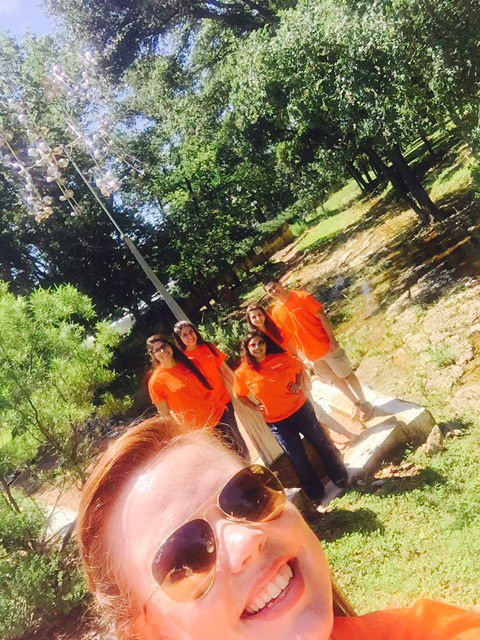 The group took the opportunity to take selfies with the overflowing creek. In the nineteenth century, Salado was also home to Salado College, which had 300 students at peak registration. Unfortunately, in 1901 the college burned down leaving ruins which have since been converted into a public park. The ruins made for an exciting photo opportunity! Following our visit to the Salado College ruins, LEAP students eagerly enjoyed browsing about in local shops. We encountered many different types of art, jewelry, and homemade goods. Helping to boost our energy, the group stopped at Salado Mercantile, a gift shop, which offered a variety of unique bottled sodas and their specially seasoned crackers. 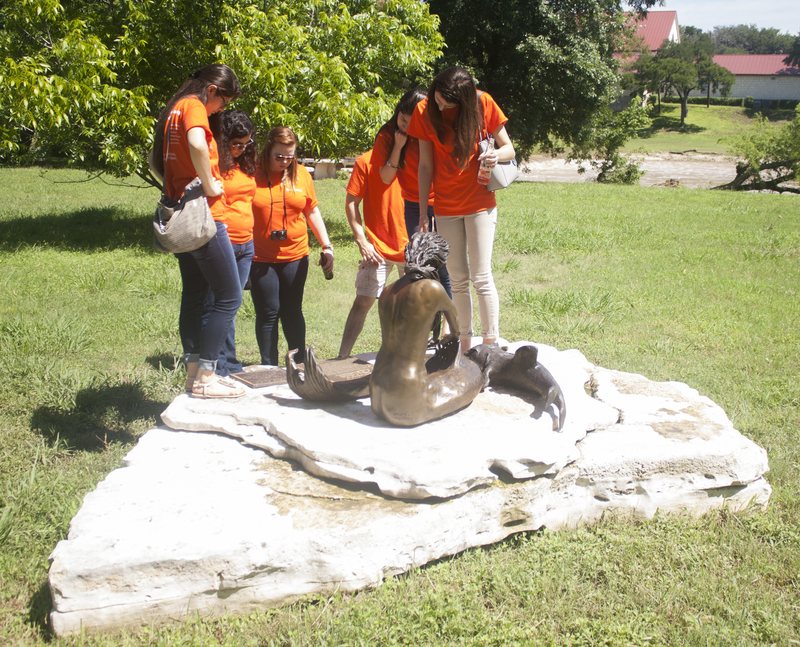 Regaining a bit of jump in our step, the LEAP Center students headed to the statue of Sirena, by Troy Kelley. According to mythology, Sirena, an Indian woman, wished to marry a brave man who did not feel the same passion for her. Drawn by her pain of unrequited love, a magic wielding catfish found her and promised her marriage with the warrior if she swam as a mermaid with him each full moon for a year. She married her brave man, knowing that no human could see her in her mermaid state, lest she be mermaid forever. The last full moon of her penance, Sirena’s husband saw her swimming in the river, sealing her mermaid fate. She now lives as a bronze sculpture, forever in anguish on the bank of Salado Creek. To suppress our mid-morning sweet tooth, we made our way to a special treat that included sampling a delicious assortment of fudge at Salado’s Mud Pies Pottery. In the end, the group favorites were the crème brûlée, red velvet, and salted caramel fudge. Inside, we also eyed with want the wonderful ceramics masterpieces by local artist, Titia Arledge. One of the unique parts of Salado proved to be the Salado Sculpture Walk. Consisting of a single pathway and a small creek, the sculpture walk was an unexpected surprise. Students enjoyed observing the unique pieces of art such as Troy Kelley’s “Handicapped Mask” and another by La Paso named Starburst for its kinetic motion. Bringing the adventure of Salado to an end, LEAP students had the opportunity to watch one of Salado’s glass blowing artists, Aaron Gist, in action as he created hand blown pieces for a Chihully-like chandelier masterpiece. Watching in amazement, LEAP students observed the art of making glasswork in one of the many local shops that exhibits the importance of art to Salado’s community. 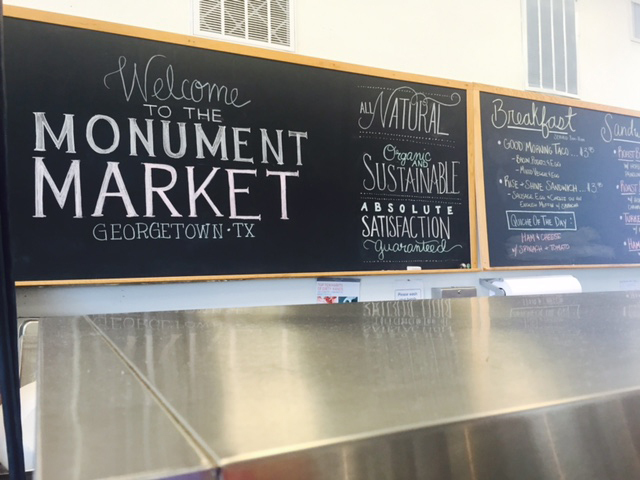 On the way back to Austin, LEAP students made a speedy stop for lunch at the Monument Café in Georgetown. The Cafe specializes in breakfasts (served all day) and lunches. We opted for the lunch fare, with our group enjoying home cooked biscuits, club sandwiches, burgers, and delightful fried blueberry pies with frozen custard. The food was good, the service was friendly and quick, and we left satisfied and in a hurry to get to the New Politics Forum Campaign Bootcamp. Our Salado adventures were so intriguing that we arrived late to the University of Texas campus and managed to walk straight into the beginning presentation. 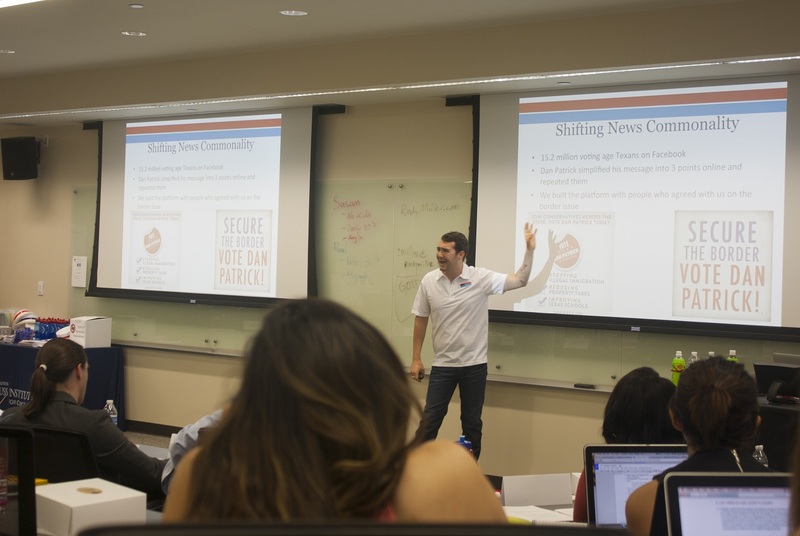 Luke Marchant, the director at Mammoth Marketing Group, who has successfully managed state and federal political campaigns for people such as U.S Senator Marco Rubio, was our first Republican mentor along with Democrat Matt Glazer. 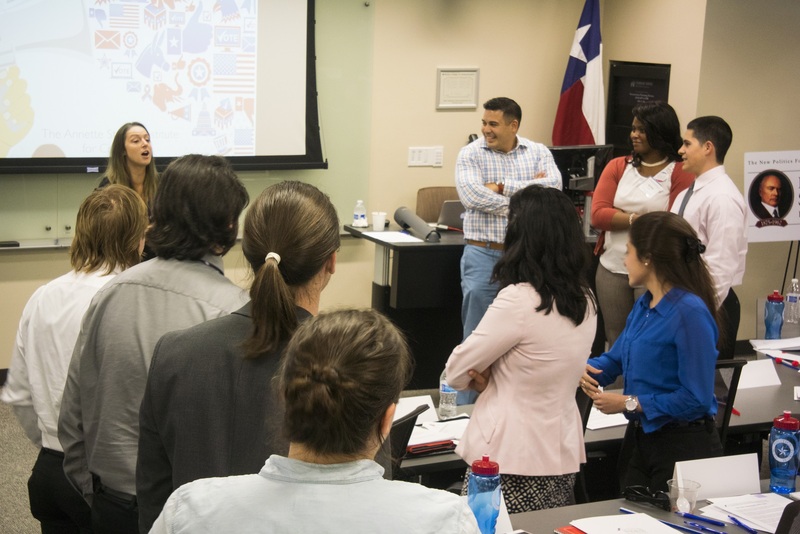 Matt Glazer is currently the executive director of the Austin Young Chamber of Commerce and is also a seasoned NPF democratic mentor. The two mentors opened up by discussing the types of campaigns and highlighted the different areas of them. We learned that using previous polling data would help us decide to simply mobilize the voters or persuade new voters. 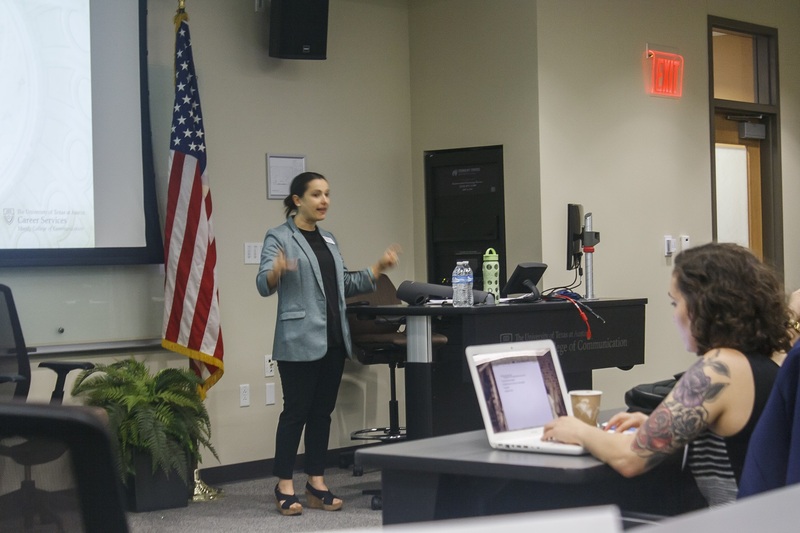 Marchant and Glazer also spoke to us about the elements of a campaign and some of those elements include knowing the reason why are you running, the issues that matter, the goal and the message that you want your campaign to portray. 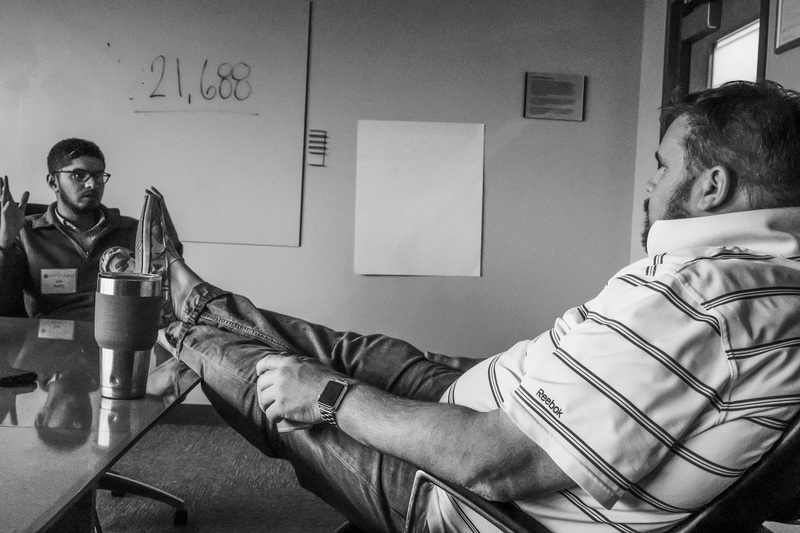 Asking yourself why you are running is one of the most important questions of campaigning. After a short break, we were introduced to Rob Johnson and J.D. Gins. 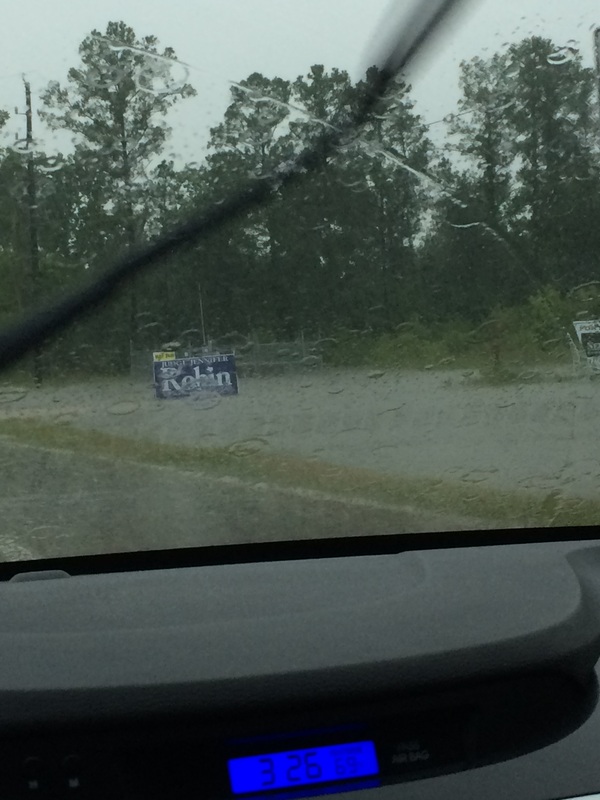 Rob Johnson is the former campaign manager for Rick Perry for President and J.D. Gins is the executive director of Travis County Democratic Party. Like the first two speakers, Gins and Johnson are men of opposing parties to fulfill the nonpartisanship ideals of the program. Both speakers agreed that running a campaign involves “blocking and tackling”, meaning that following the steps to create a successful campaign is key. Rob Johnson pointed out that the Digital Director is one of the most important persons in a campaign and that adapting to society is crucial to produce a win. When Gins and Johnson are determining if they want to run the campaign of a candidate, they ask a few important questions, including whether they have enough money, whether there’s an open position, and most importantly whether a candidate WANTS to run and put in the effort that it takes to win. As Gins said, “When you walk in, do the work in front of you” meaning that not even the candidate is above the smallest job that needs to be done. 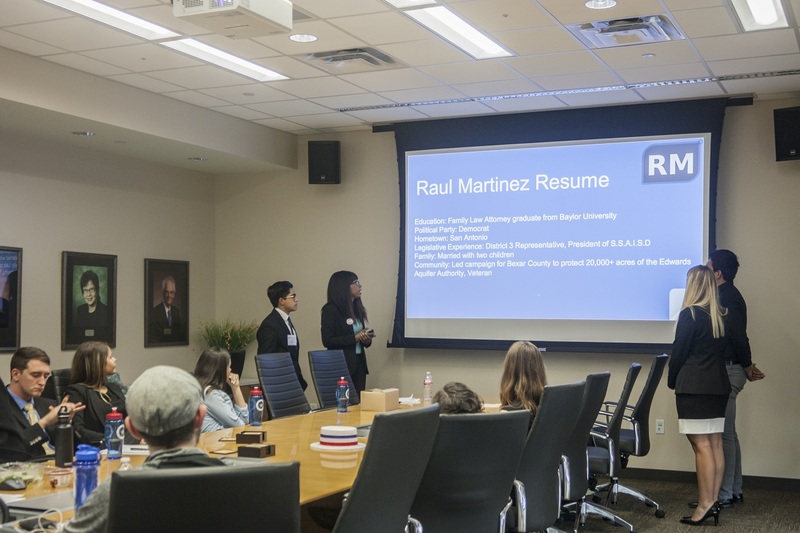 Before closing their presentation and going to a break, the two men let the students know that they look for people who take direction well, work hard, are willing to challenge the senior staff, while being humble enough to ask for help. When we returned from our break, Pasha Moore spoke to us about fundraising. She informed us of the reasons individuals give to campaigns and the components of a finance plan. There are many reasons that people give, such as friendships, habit, to change or affect policy, but Moore let us know that the main reason that people give to campaigns is simply because they are asked. She also emphasized “the ask”. There are different ways of asking and you should always be confident and straight forward when asking people to donate money. Finally, she closed by reminding us to always thank the donors. Seeing as the afternoon was turning into evening, we finished the last session to emulate a real campaign scenario with a “working dinner” of pizza and salad, while being able to meet and interact with our teams for the first time. The weekend of campaign bootcamp consists of long days of training, finishing with presentations from each team on Sunday. 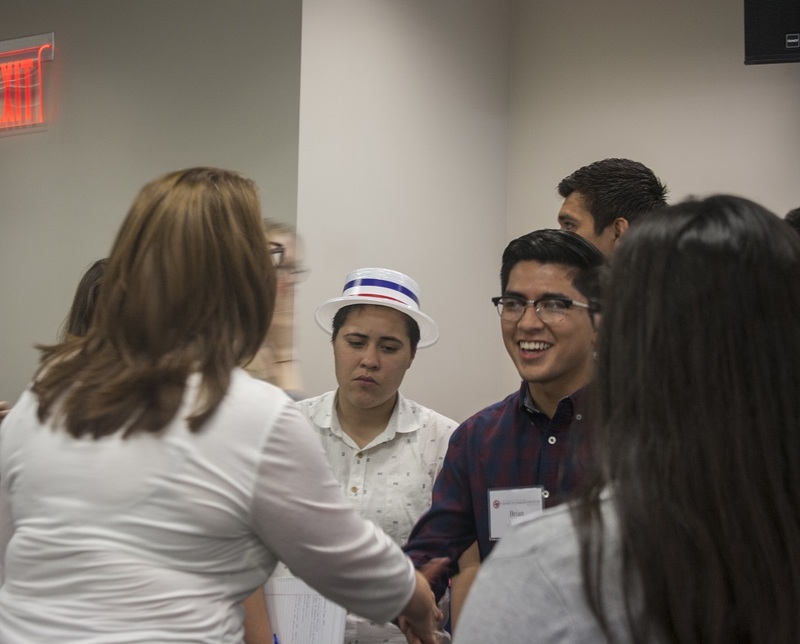 Ironically enough, most of the LEAP Center students, Republicans at heart, were placed on Democratic teams. This might stem some interesting debate among peers. Our first task as a team was to pick a name. This proved to be a great way to interact with our team for the first time and share ideas. After so much brainstorming we finally came up with our team names and began planning for our presentations. We shared our ideas on different political views, which should prove helpful in order to strategize for our campaign plans. After our “working dinner” it was time to get back to our next presentation on volunteering. Executive director of the Dallas County Democratic Party, Taylor Holden, presented how volunteers are the building blocks to a campaign. We learned about recruiting, training, and rewarding volunteers. Volunteers will authenticate and build momentum for a political campaign. We learned the cardinal sins and commandments of volunteering such as never lie or skip training and building relationships with volunteers. 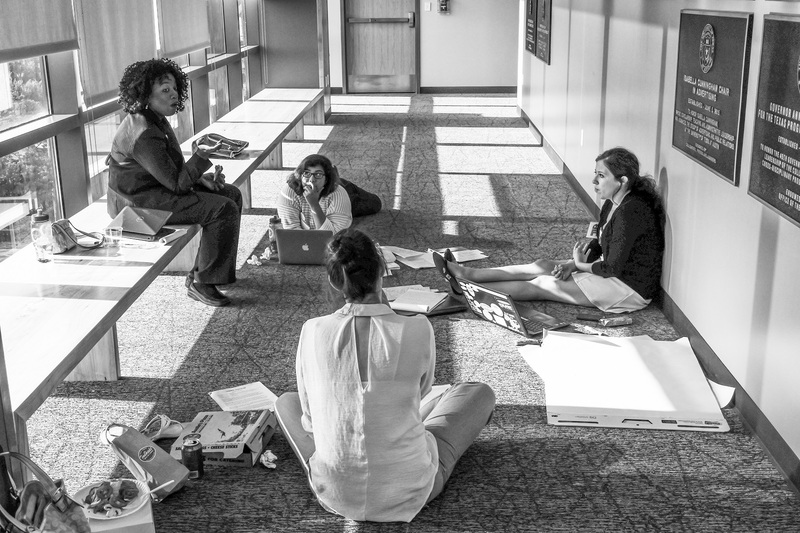 Seen by most as the most important building block of a campaign, we sat with bated breath while taking in all of the complexities that volunteering entails. Exhausted, we ended our first day of campaign bootcamp and headed back to the hotel. 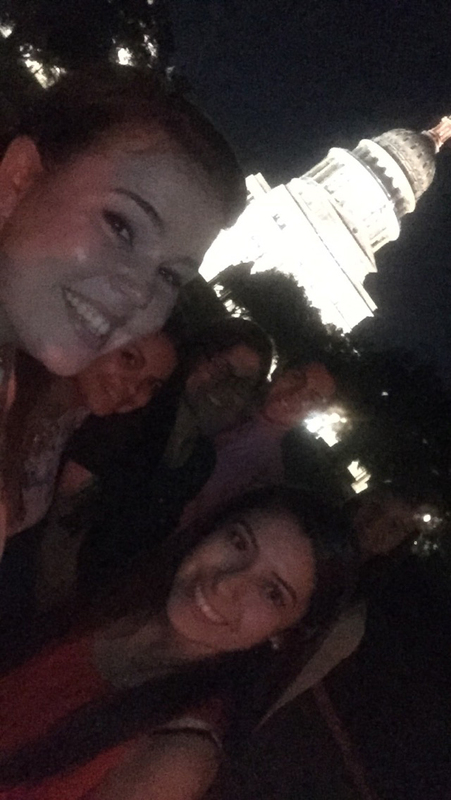 On our way back to the hotel we made a quick stop at the Capitol building for a goodnight selfie. Excited about our day tomorrow full of training, we headed to bed ready to learn and soak up all that boot camp has to offer. LEAP Center Preps for Campaign Bootcamp! 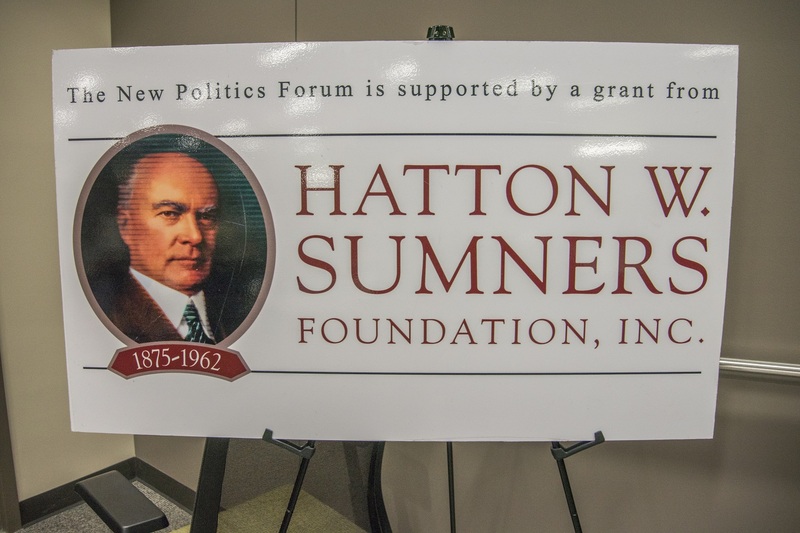 Six LEAP Center students started preparation for the New Politics Forum Bootcamp in the last twenty-four hours. Preparation included the drive to Austin, a fine meal at Shiraz Shish Kabob, and a morning of site-seeing around the Austin Area. The meal at Shiraz Shish Kabob was entertaining, primarily because half of the students had actually never eaten Mediterranean food! After some Hummus, Tzatziki, Chicken Kabob, Lamb Kabob, Gyros, and Baklava, at least two of those three will probably go back for more. After plans to kayak on Lady Bird Lake fell through because of the potential for bad weather and unsafe lake conditions, we decided to head north to Salado, a small tourist community that offered a morning full of fun! 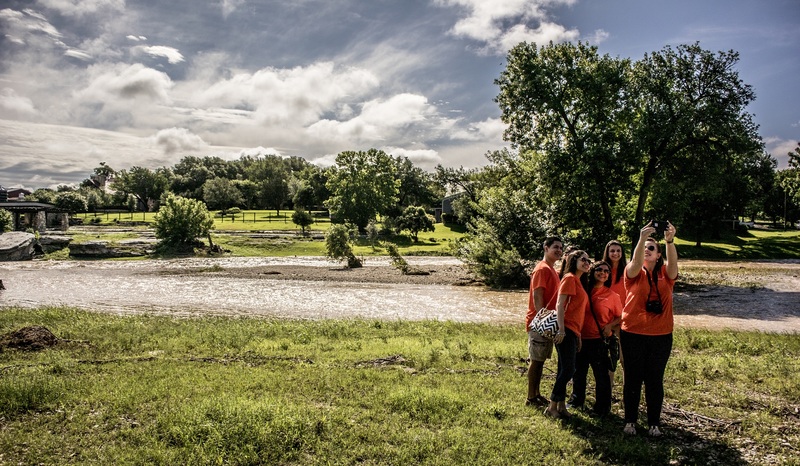 This included Salado Mercantile, Salado Glassworks, the Salado Sculpture Walk, the Salado’s Mud Pies Pottery and, of course, Salado Creek–which was quite full. More to come following our first day at the Bootcamp! Author mikeyawnPosted on May 29, 2015 May 29, 2015 Categories Art, Civic Engagement, Jobs, Politics, TravelTags LEAP Center, New Politics Forum, NPF, Salado, Salda Glassworks, Shiraz Shish Kabob, SHSULeave a comment on LEAP Center Preps for Campaign Bootcamp! 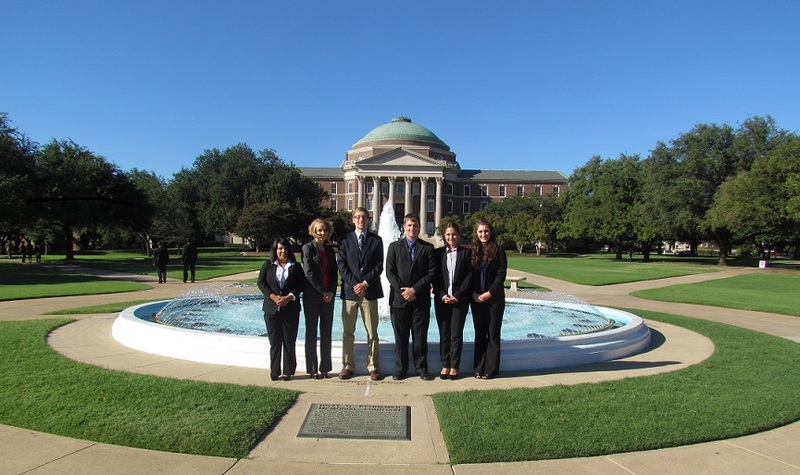 The second day of our Dallas trip started early Saturday morning at the Southern Methodist University campus. SMU has one of the most beautiful campuses we have seen. The architecture is the first thing that captures your eye. Dallas Hall, for example, is beautiful, and it was the first building on SMU’s campus (1915), designed by Shepley, Rutan, and Coolidge. 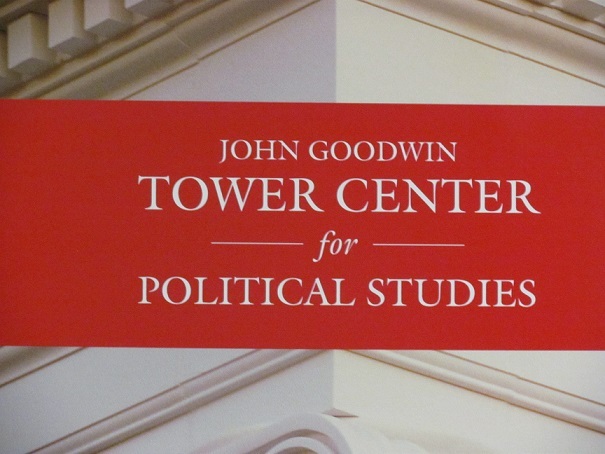 Also impressive was the John Goodwin Tower Center for Political Studies, the location for our New Politics Forum Seminar. 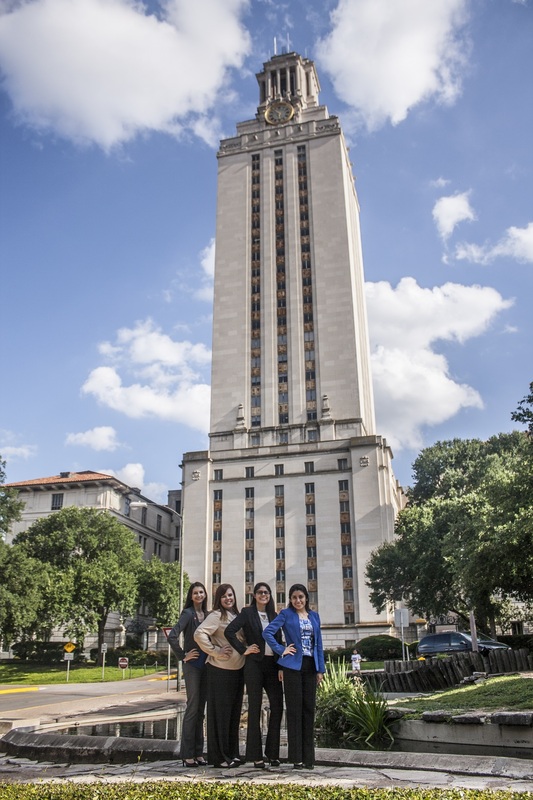 Given Tower’s history serving Texas, it was a fitting venue for our conference on public careers. We first attended a panel on State Policy Making, featuring Chancellor Lee Jackson, Representative Kenneth Sheets, and Representative Rafael Anchia. 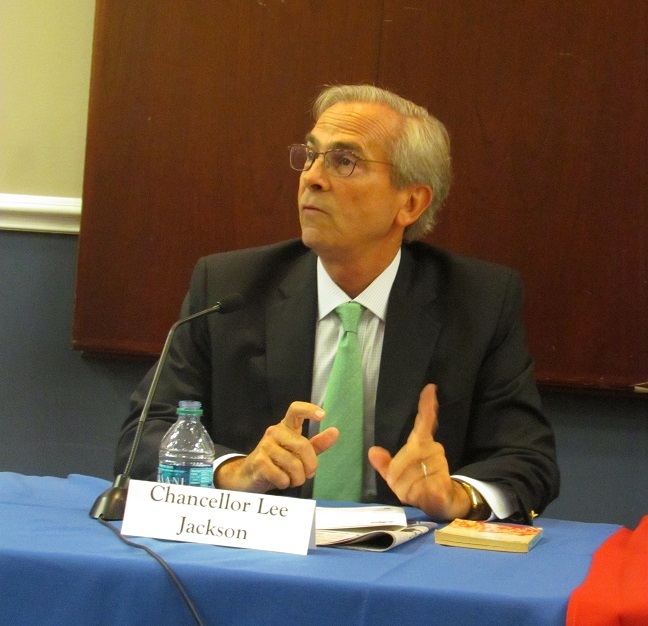 Chancellor Jackson Lee was formerly a member of the House of Representatives and is perhaps unusual in that he owns no social media accounts. He emphasized the importance reliability and integrity. Representative Anchia, a first generation American, was the speaker who stood out the most to us. He emphasized that politics and public service are separate, and that the former should never get in the way of the latter. 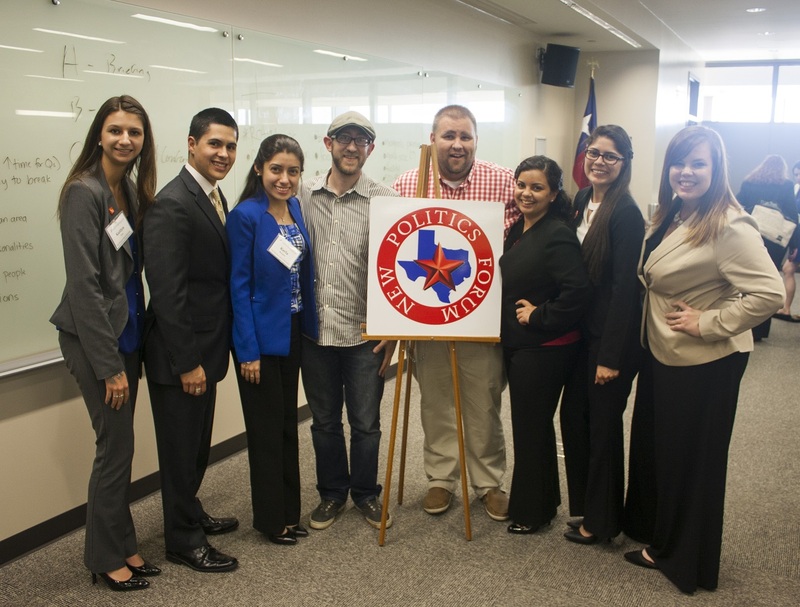 He was also spent the most time with students from SHSU, appearing impressed with the school’s LEAP program. 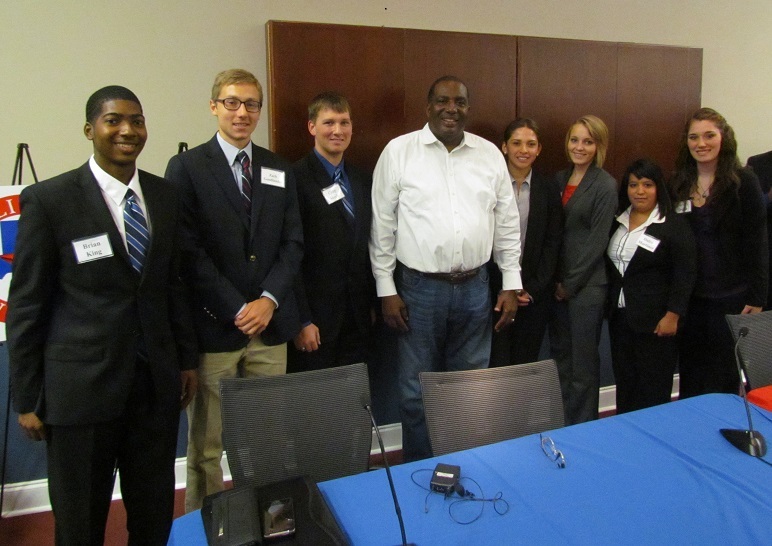 Our second session featured the keynote speaker, Senator Royce West. He is a fine speaker, and he interacted well with the audience. He emphasized integrity as well as the importance of bipartisanship. He applied these qualities to his own career, and noted that he was able to save his own legislative agenda by “listening and working with people.” He also graciously stayed after with us, and encouraged us to continue getting the most out of our education. The last panel of the day addressed the Media and was led by Carol Reed, of Reed PRC, and Gromer Jeffers, from the Dallas Morning News. Both, again, pressed issues of integrity and, members of the media, stressed credibility. 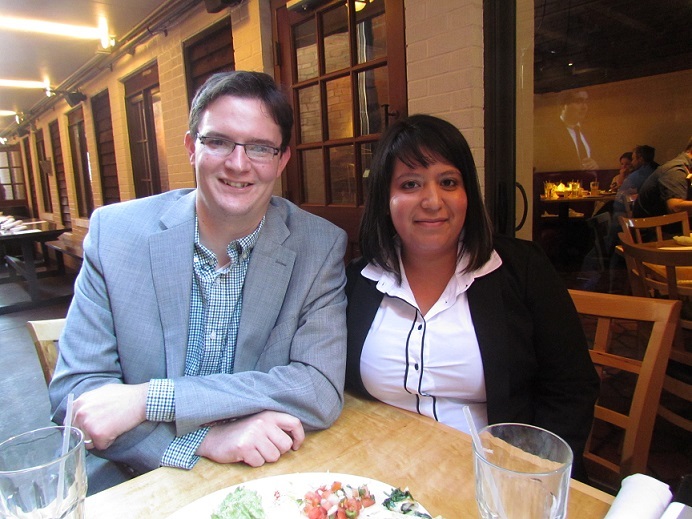 Following the event, we moved to Bandito’s Mexican Cantina for food and conversation. 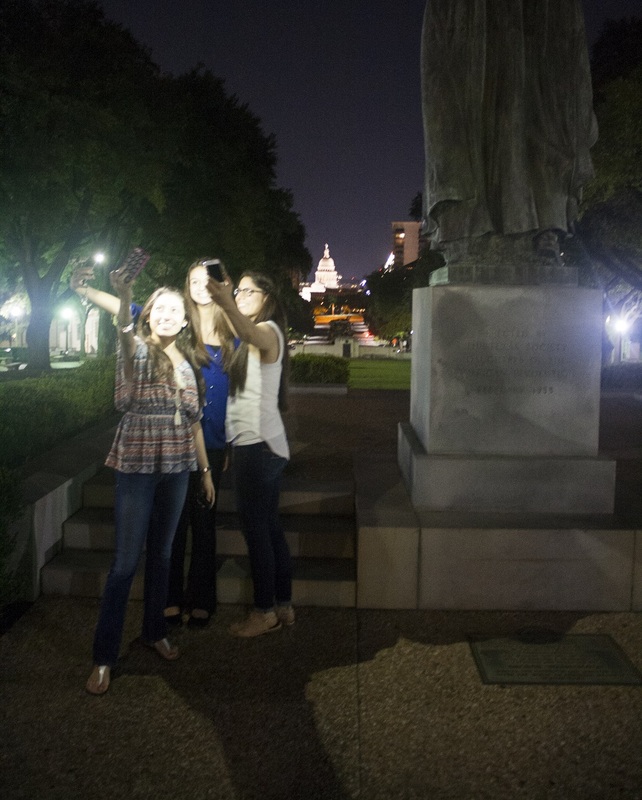 We met Casey Bingham, who works for Greg Abbott and is a member of the Young Republicans of Dallas. We also met a student from UNT, who told us about a program the University offers focusing on non-profit economics. We dined at Eatzi’s, a build-your-own meal place, that combines elements of a grocery story and a sit-down cafe. Here we enjoyed a wonderful array of foods. One of the must haves is the spicy spaghetti, with freshly prepared pasta and a spicy tomato sauce. If comfort food is your thing, the combination of the lemon chicken, mac and cheese, and mashed potatoes is the ideal combination. If you are adventurous, the sweet curry chicken offers a unique blend of ingredients and texture. For dessert, we visited a small gelato ship, and I Had the “Monkey Business” gelato, which was probably the best ice cream I’ve ever had, offering banana, cinnamon, vanilla, and—as a surprise—chocolate. 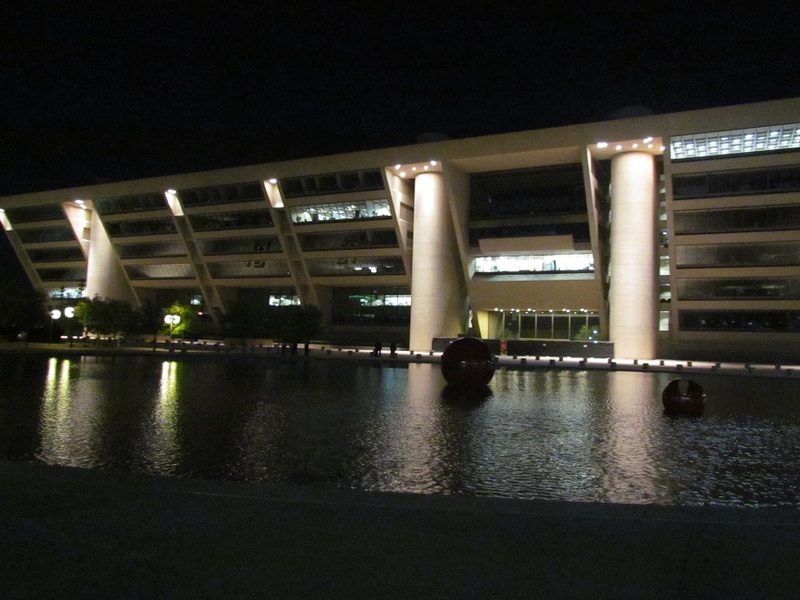 With some energy restored, we headed to Dallas City Hall, which was designed I. M. Pei, probably the most celebrated living architect. It was a beautiful and peaceful scene. 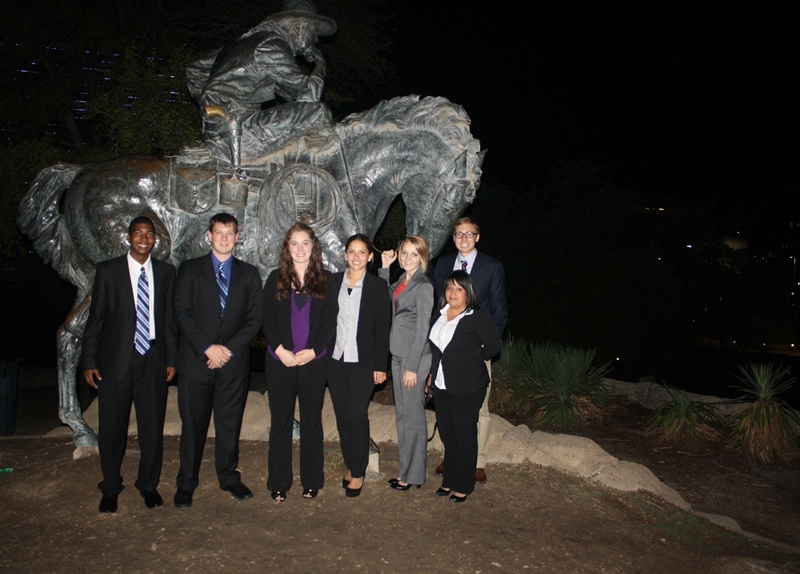 From there, we checked out Pioneer Plaza, which was created by Robert Summers, a Texas artist. It is the largest bronze sculpture in the world and makes for a dramatic scene in downtown Dallas. It was the perfect way to end the day!